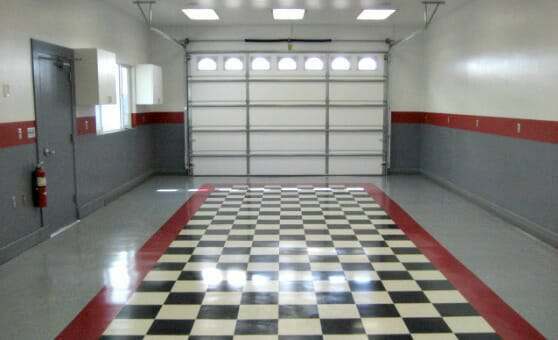 Welcome to our garage floor gallery. 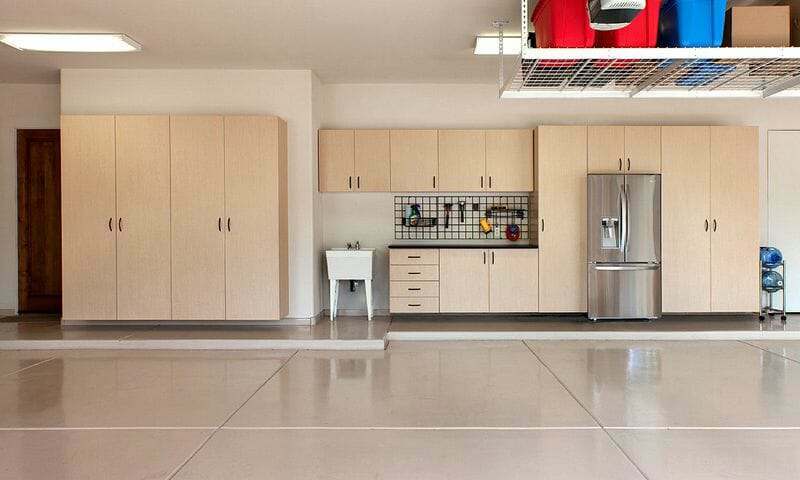 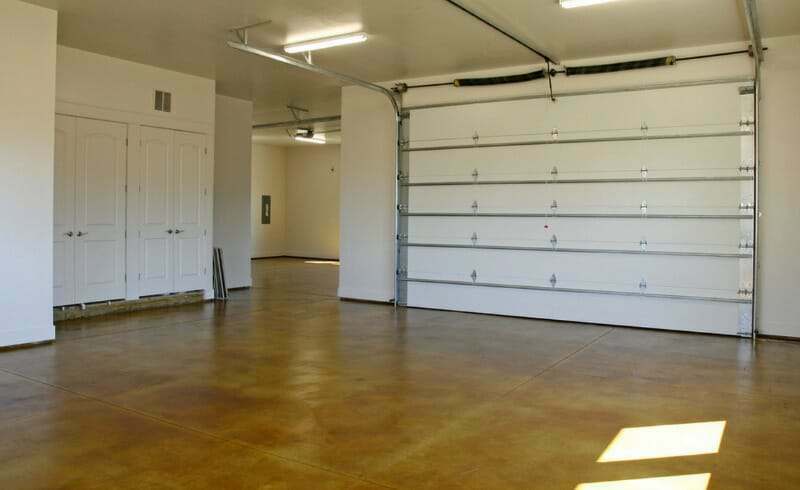 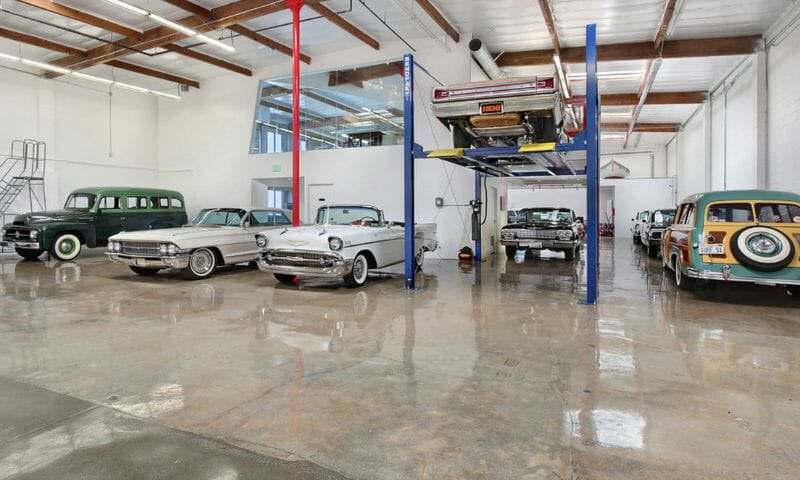 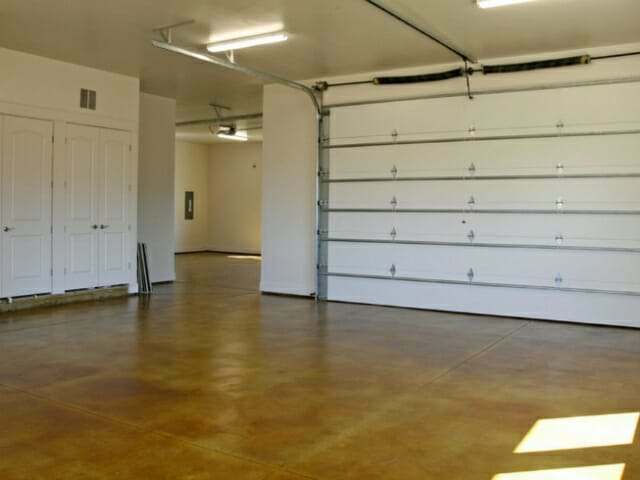 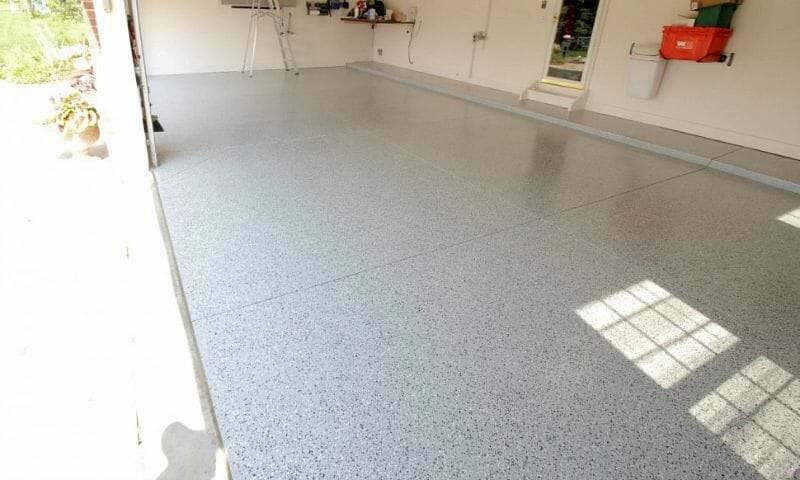 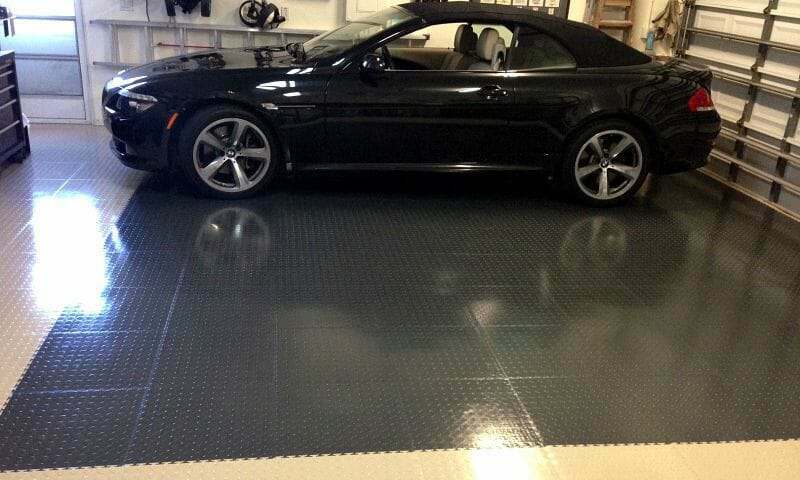 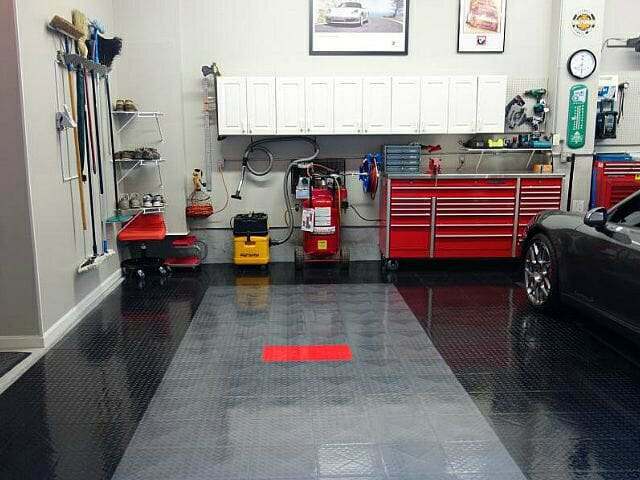 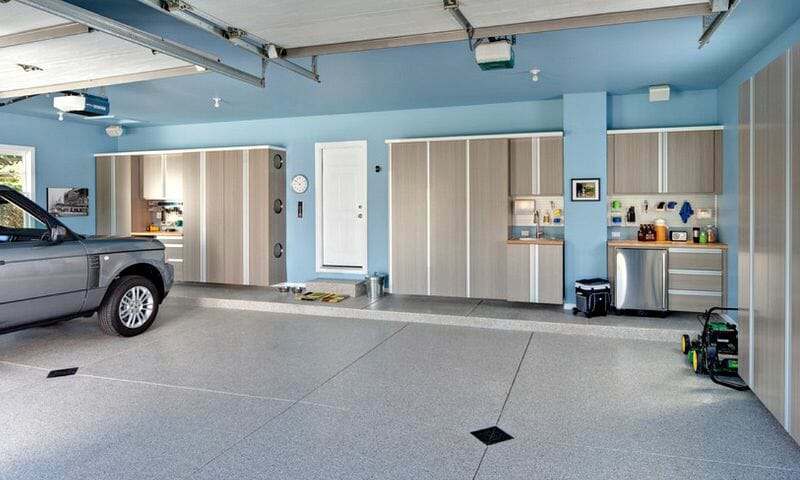 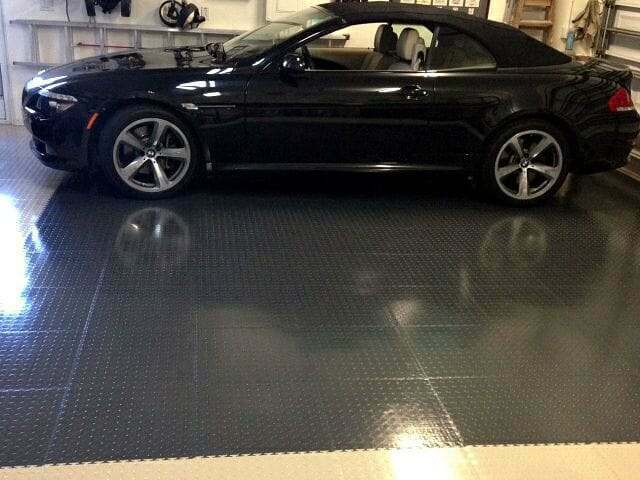 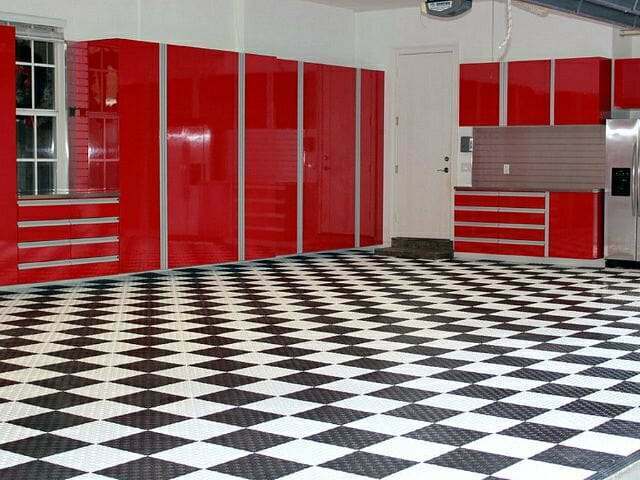 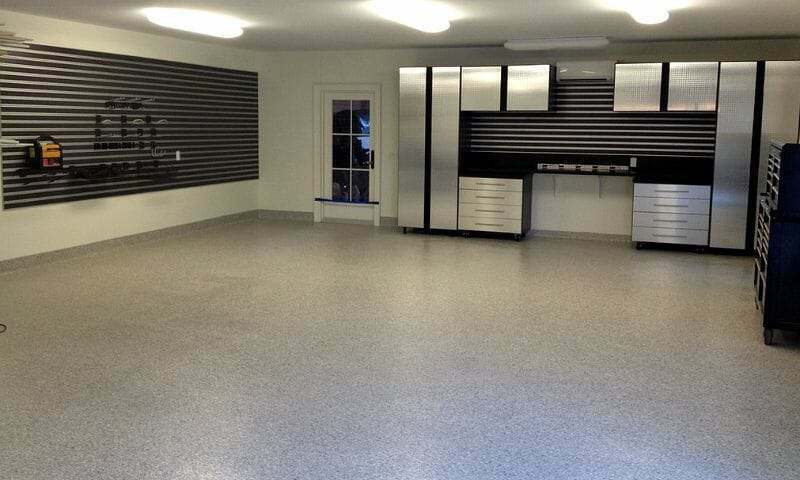 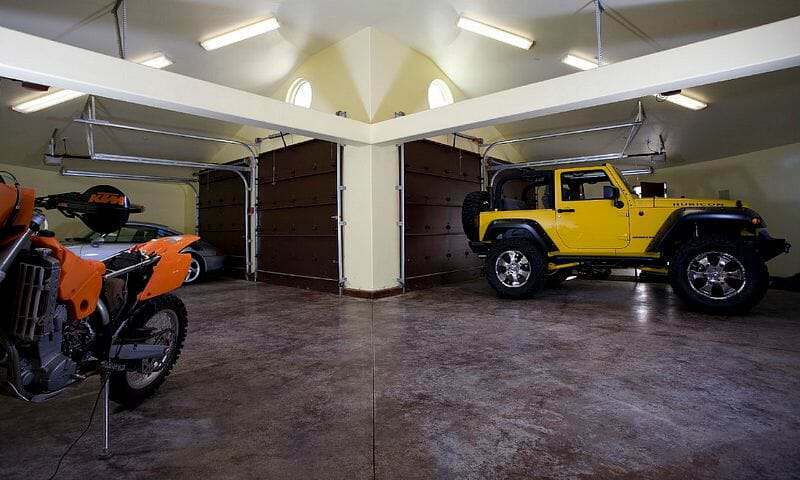 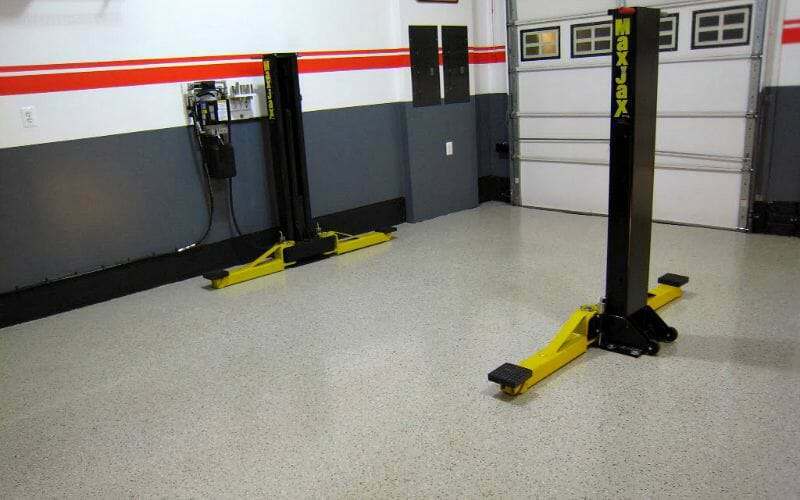 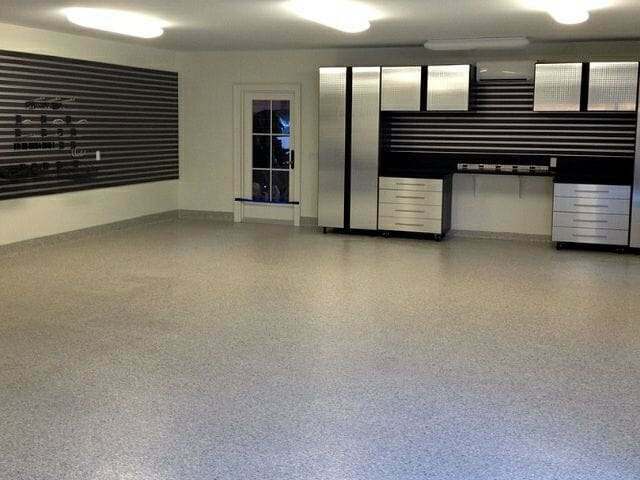 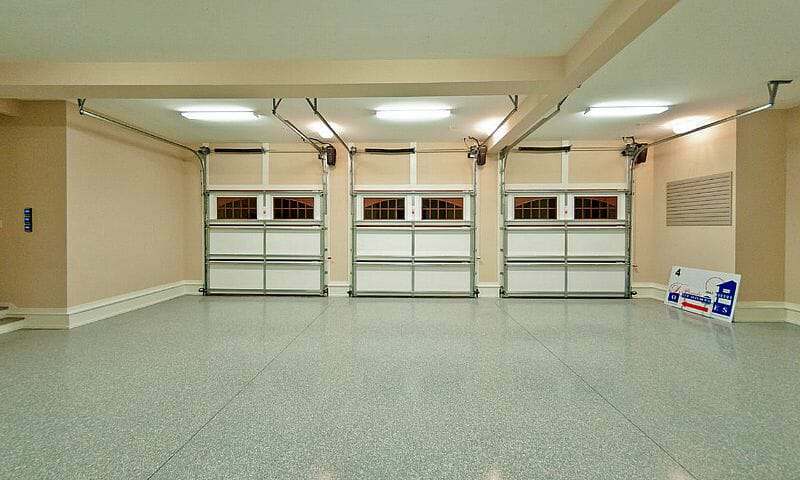 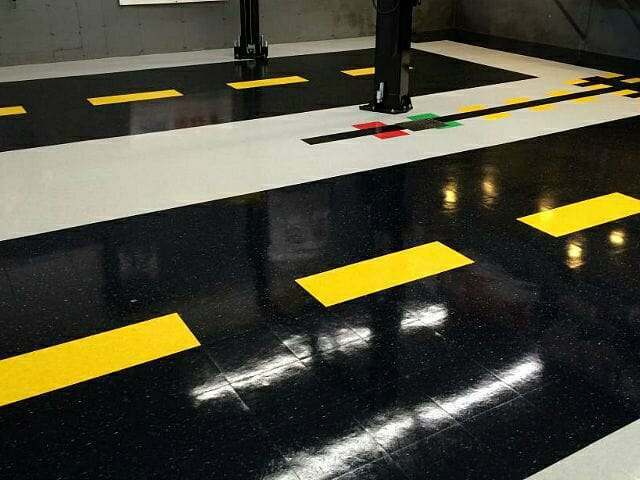 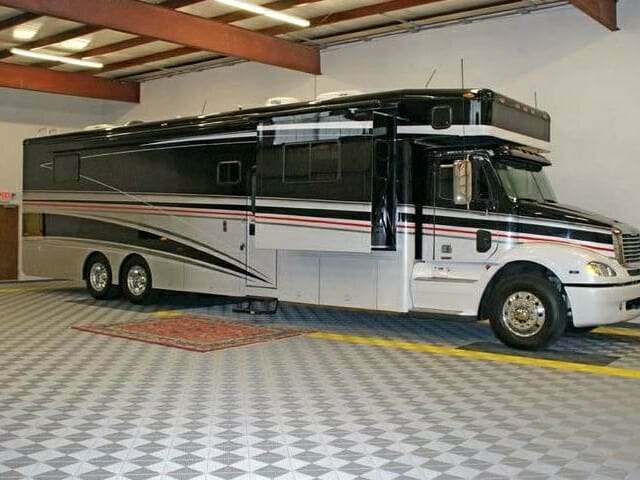 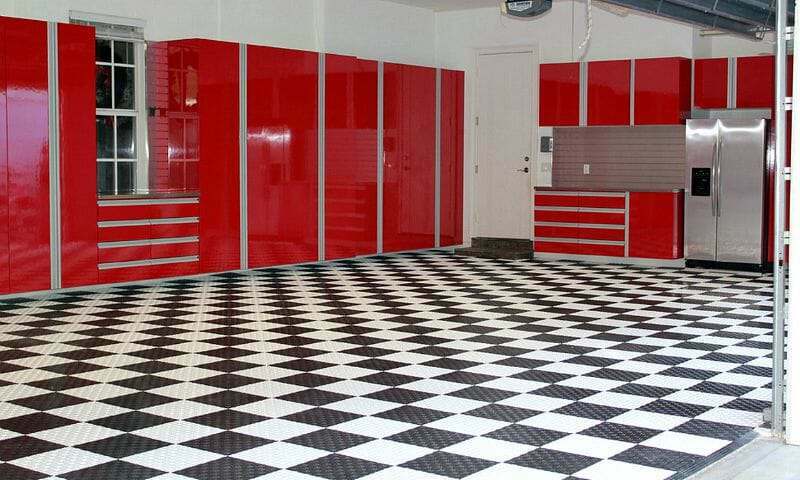 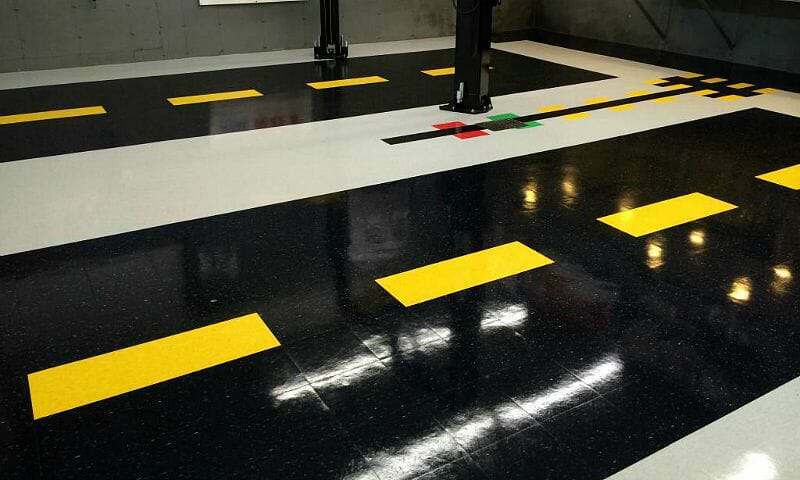 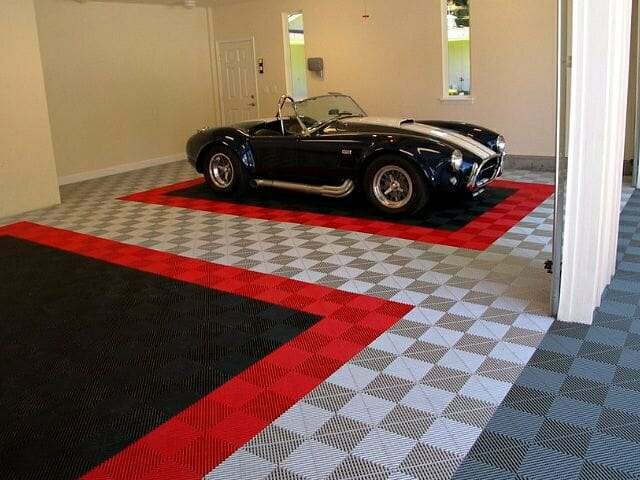 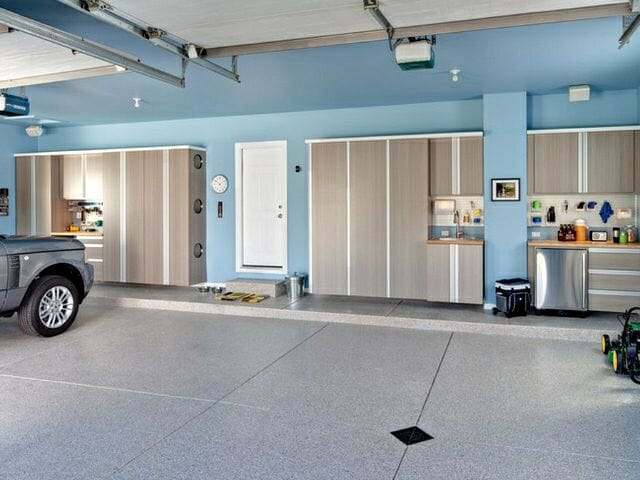 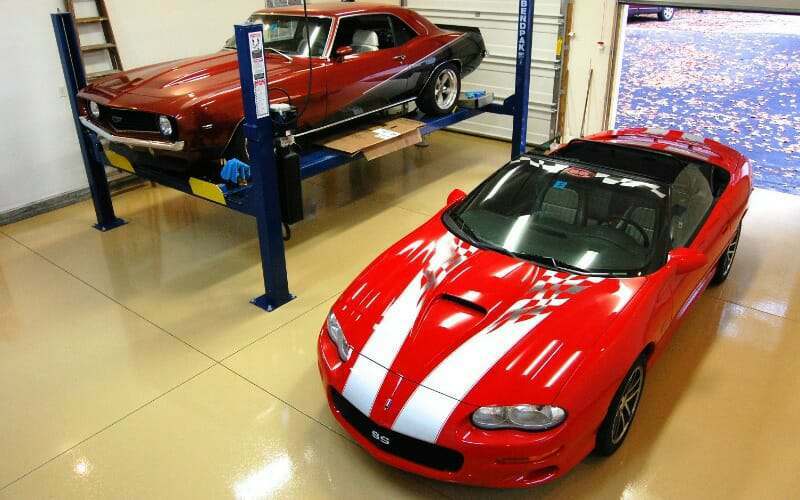 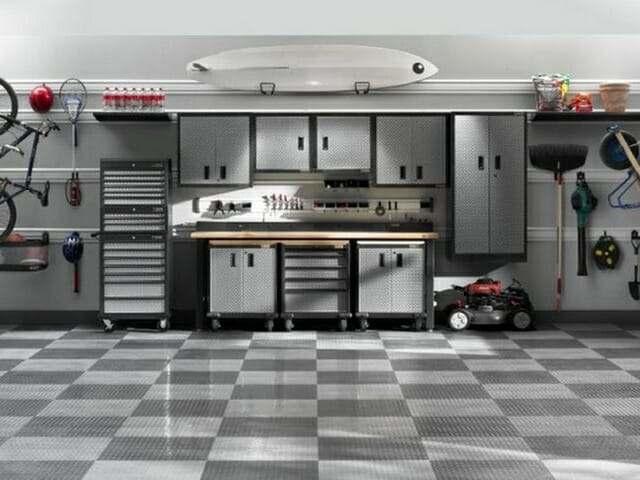 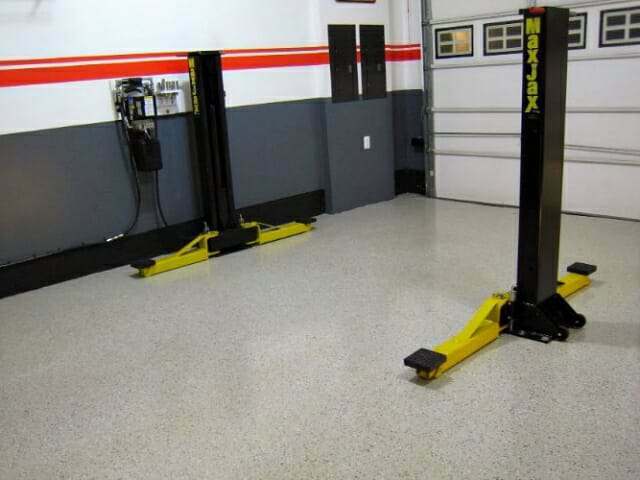 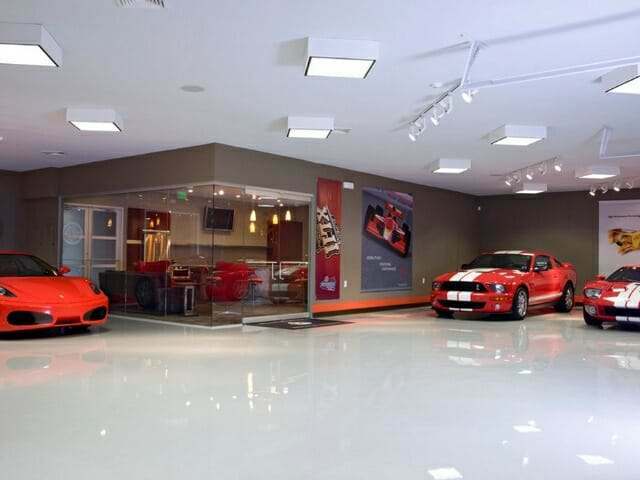 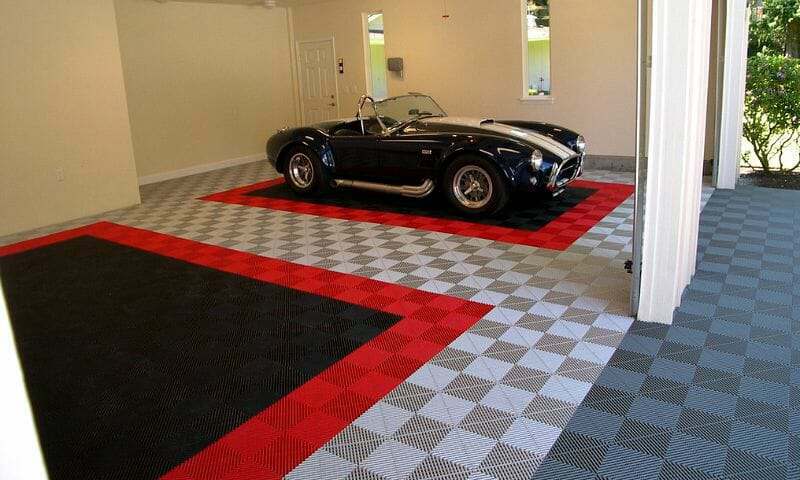 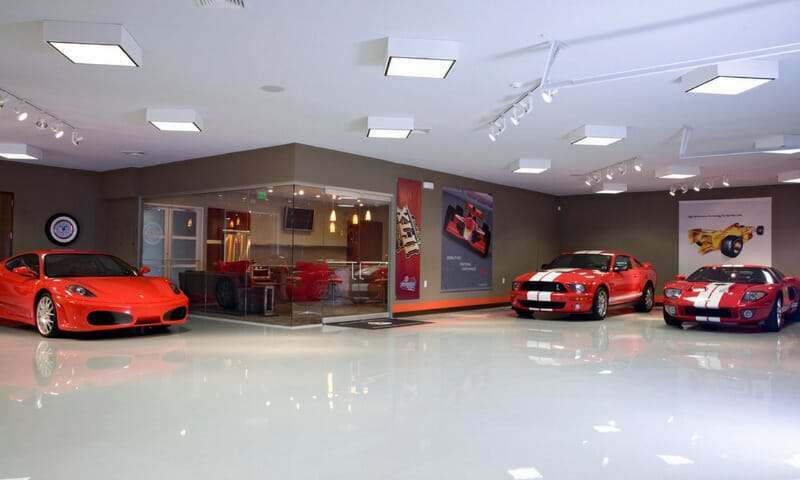 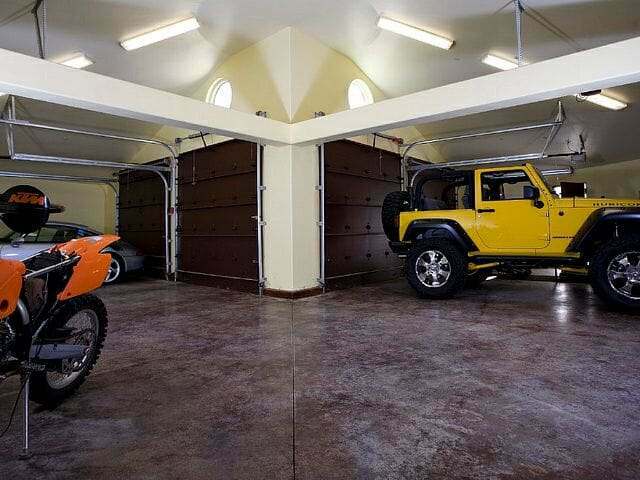 We have included this gallery to help you visualize the various garage flooring options available to you. 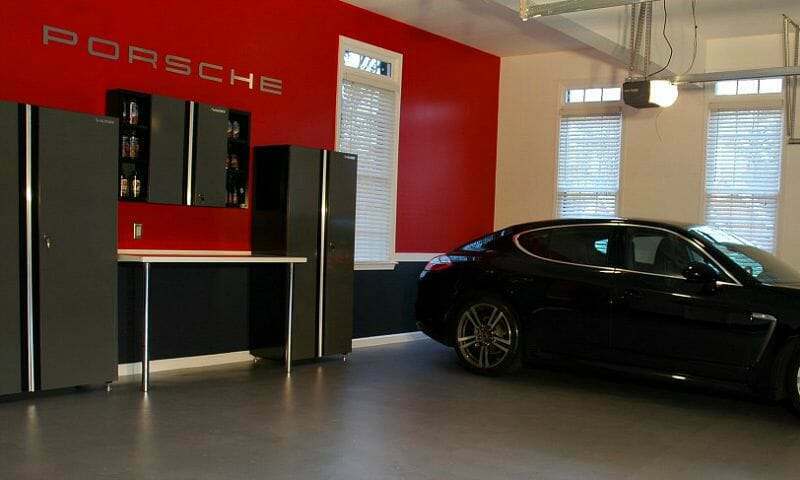 Please note that we do not take credit for any of these images as our own work. 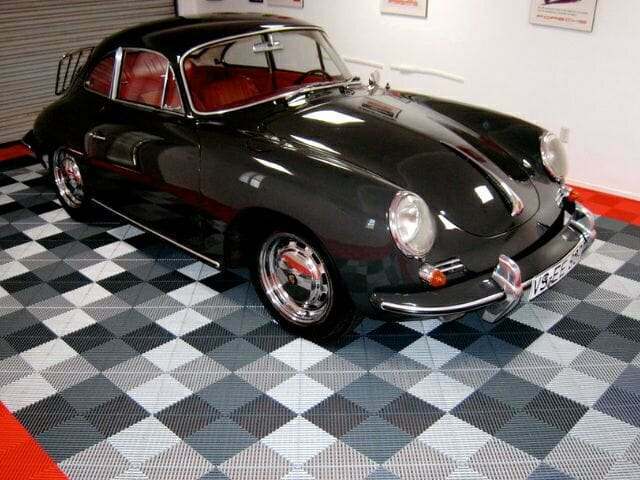 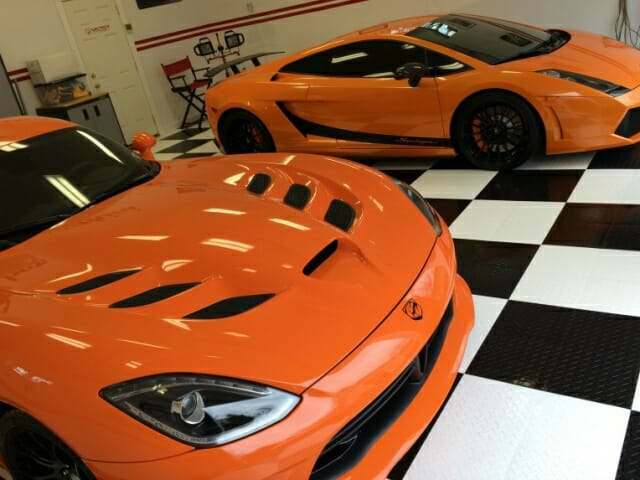 In fact, these images have been provided by many of our readers and sponsors, as well as various garage flooring contractors, designers and installers. 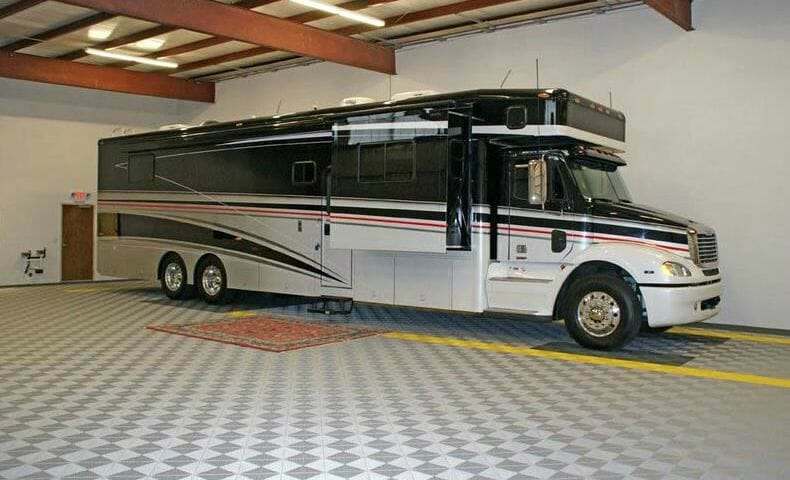 Just click on any image below to enlarge the picture and start the tour. 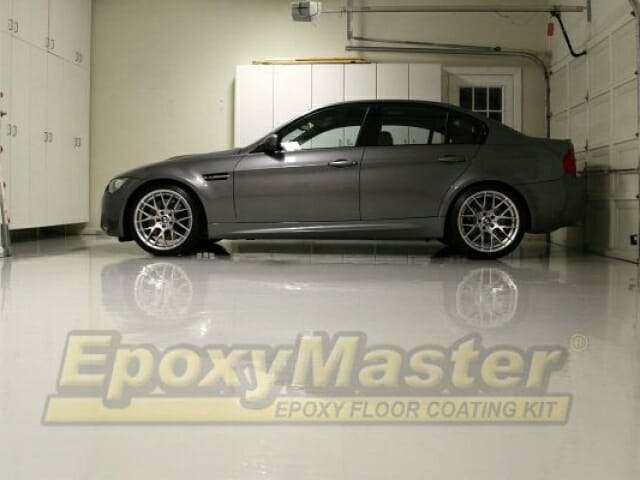 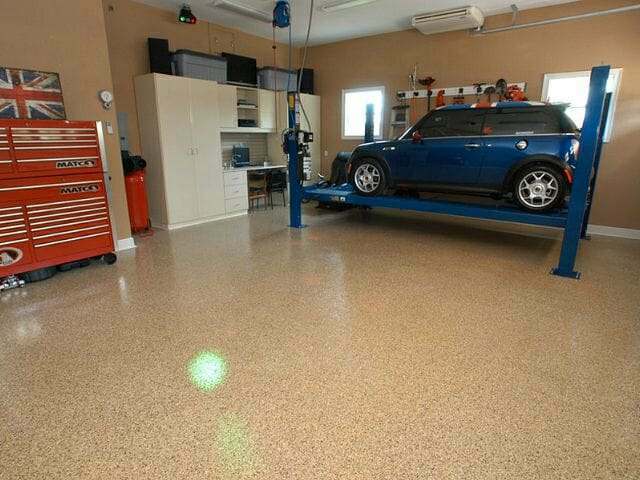 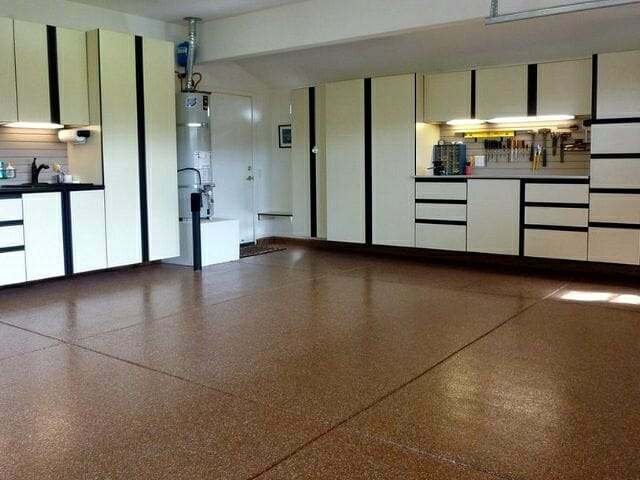 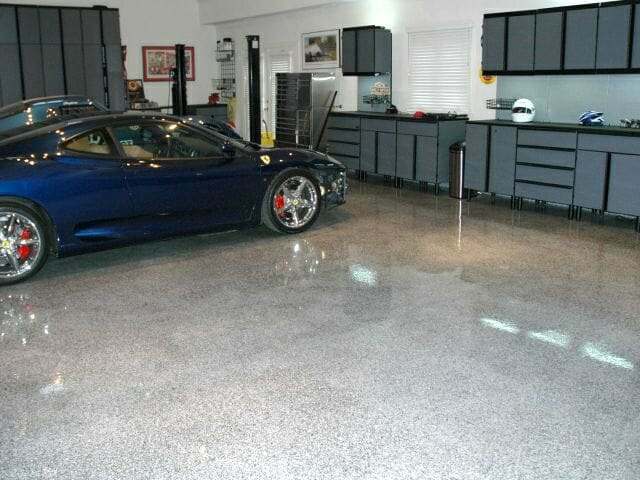 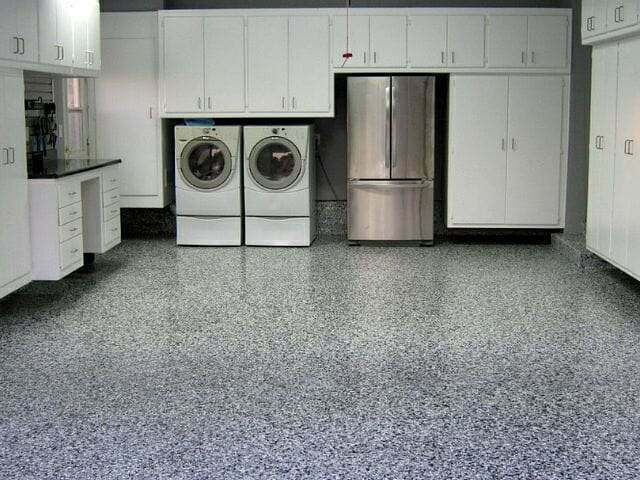 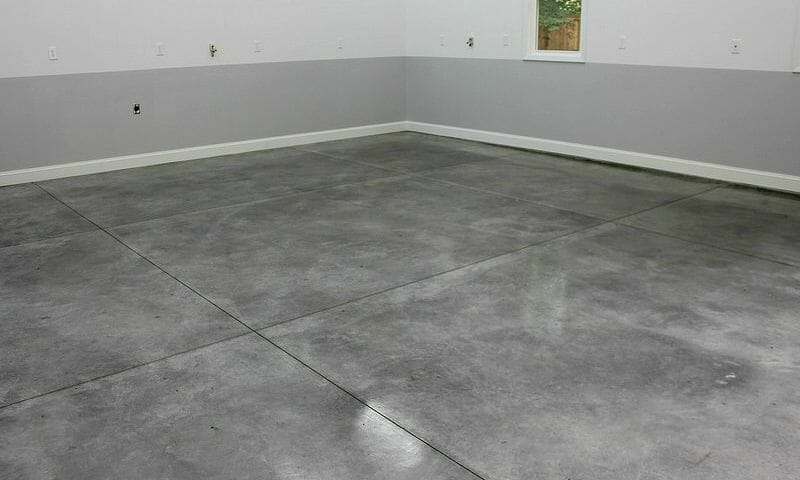 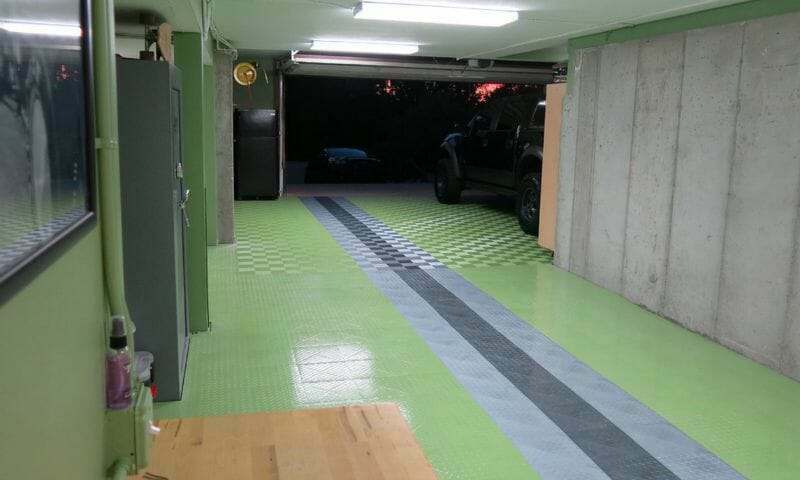 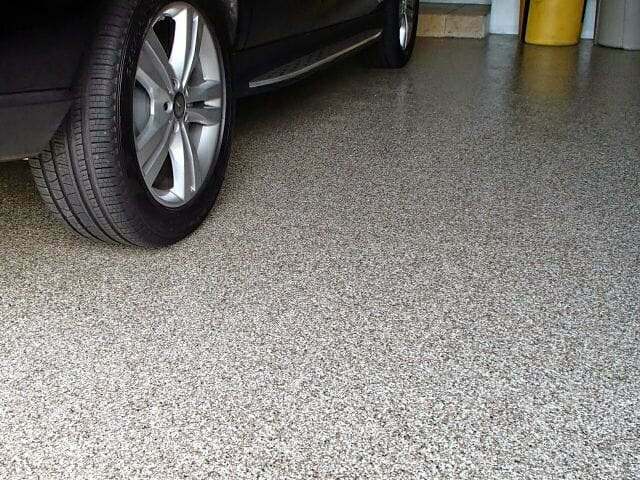 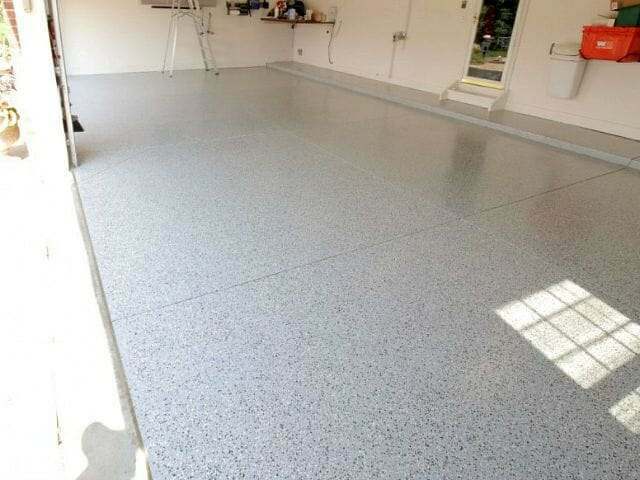 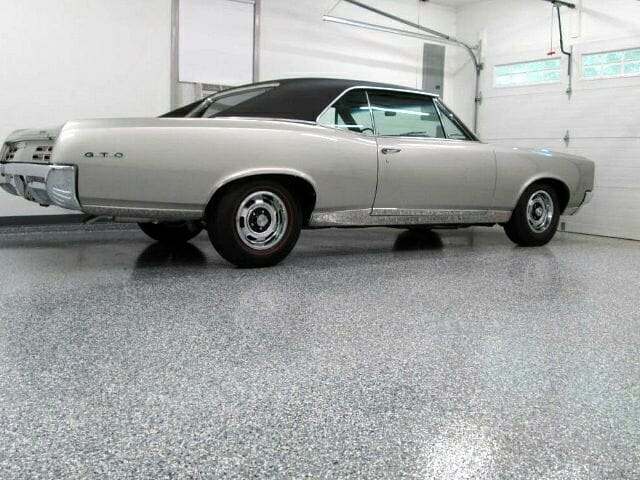 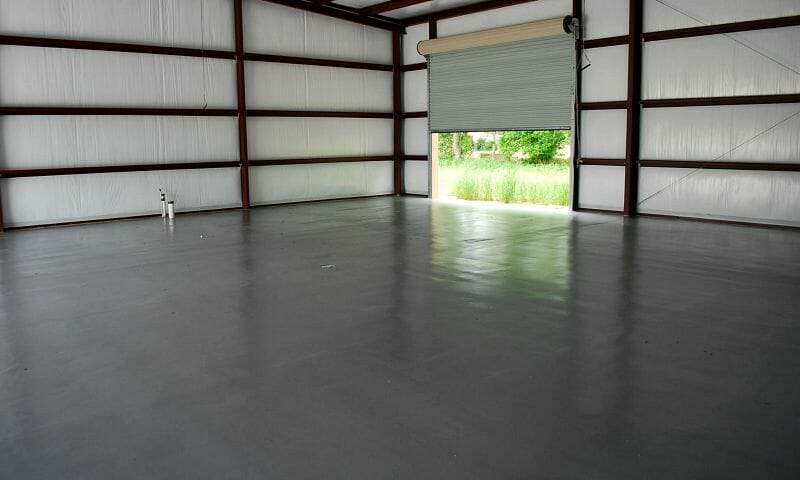 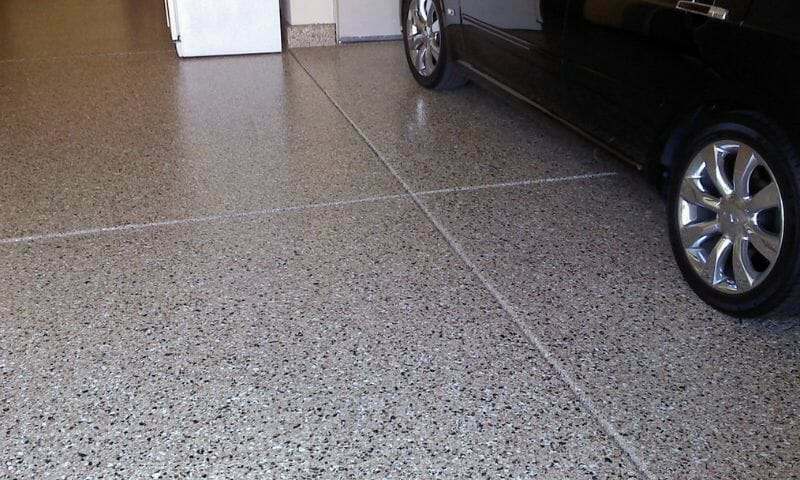 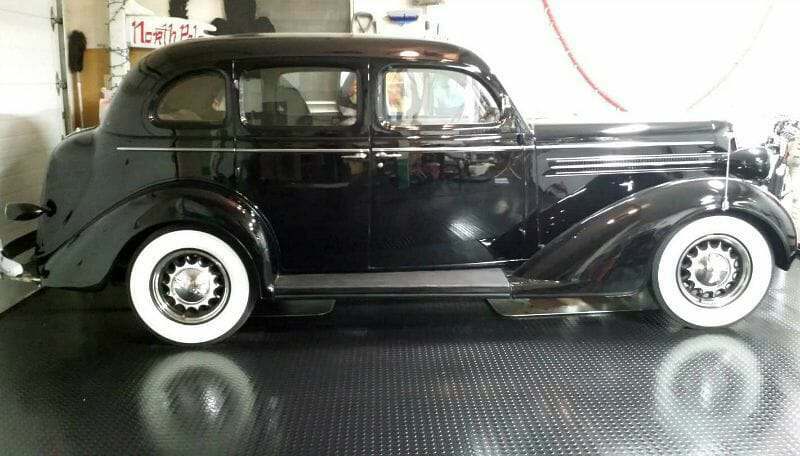 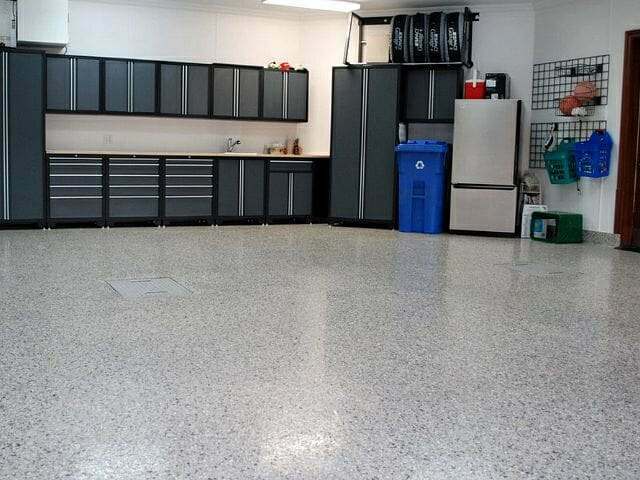 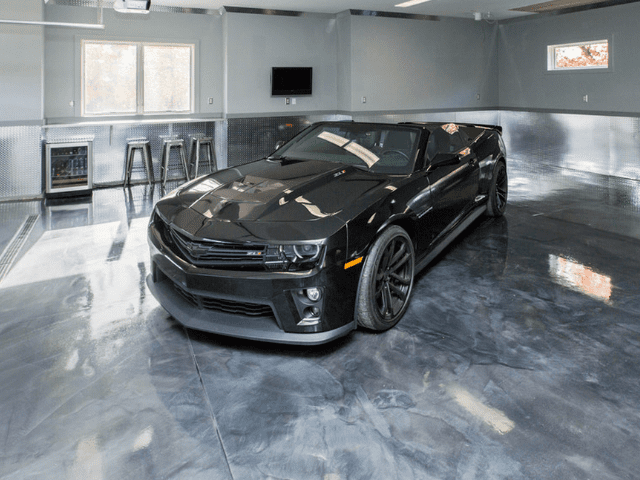 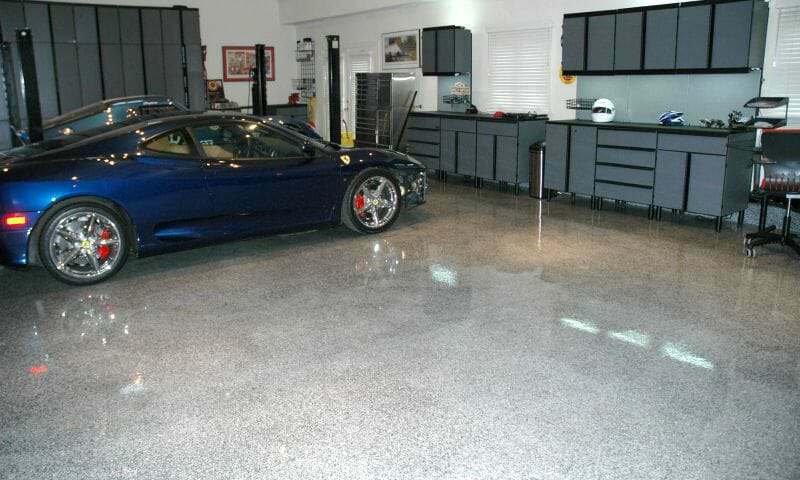 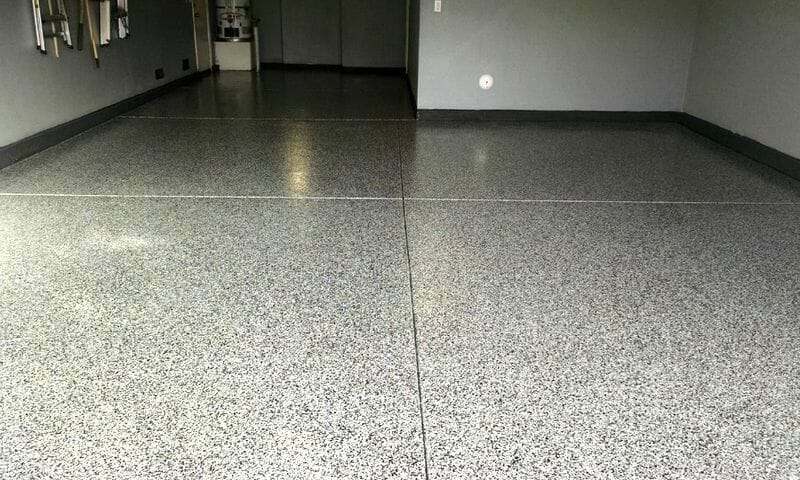 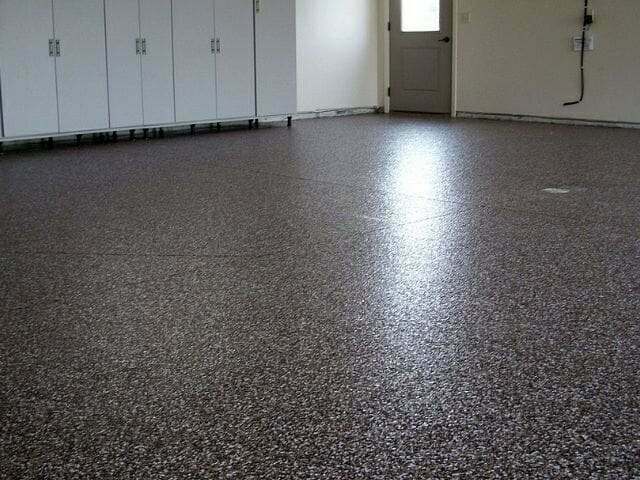 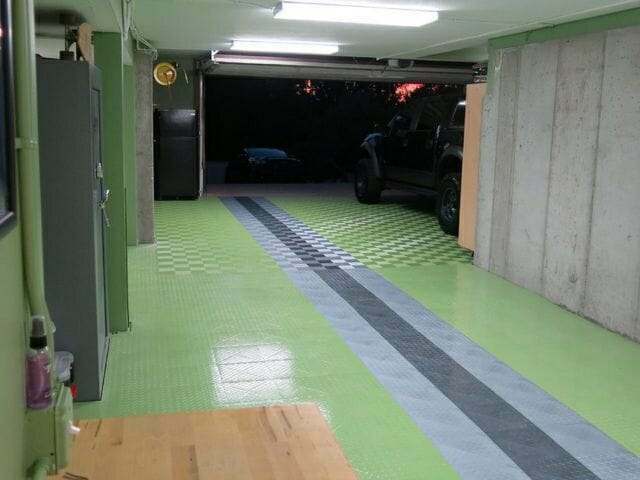 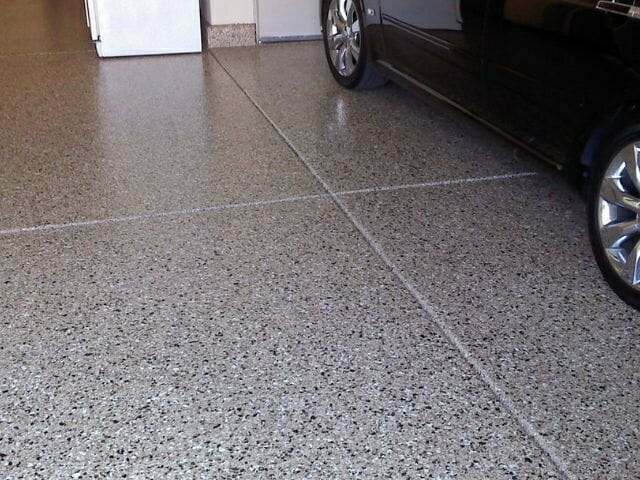 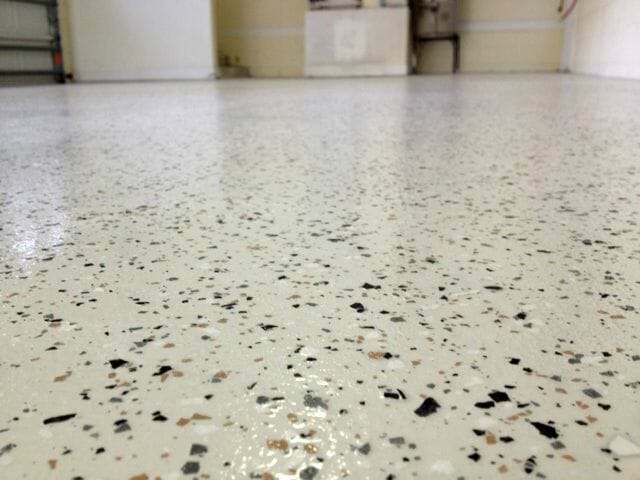 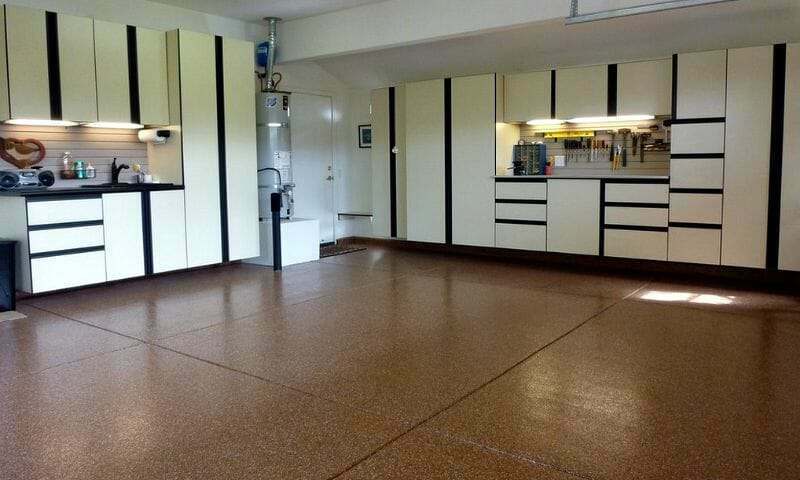 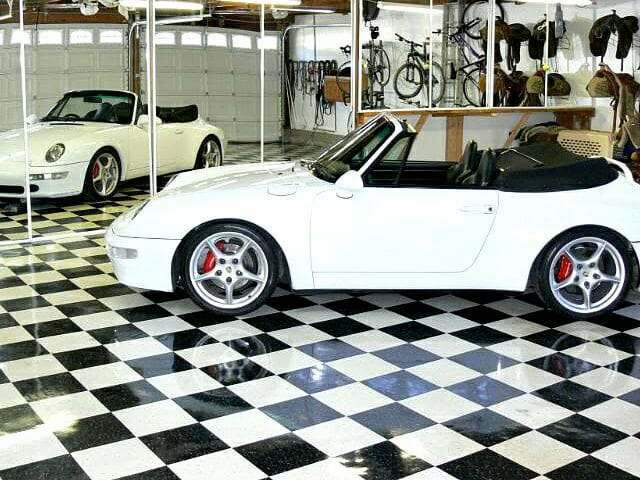 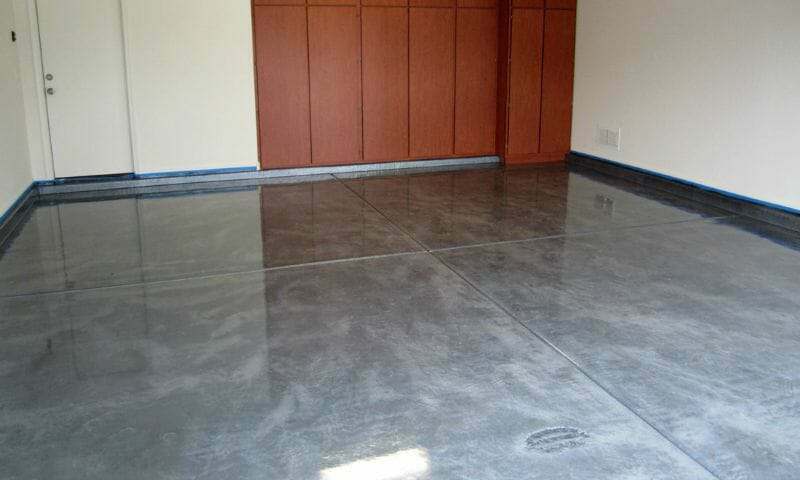 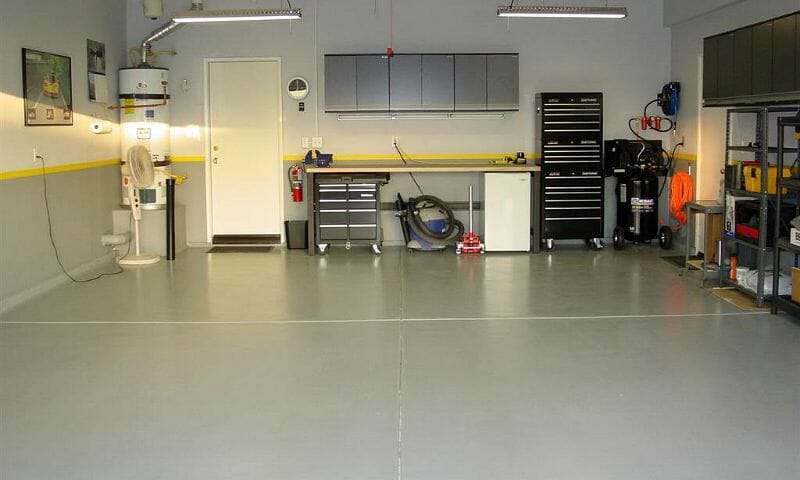 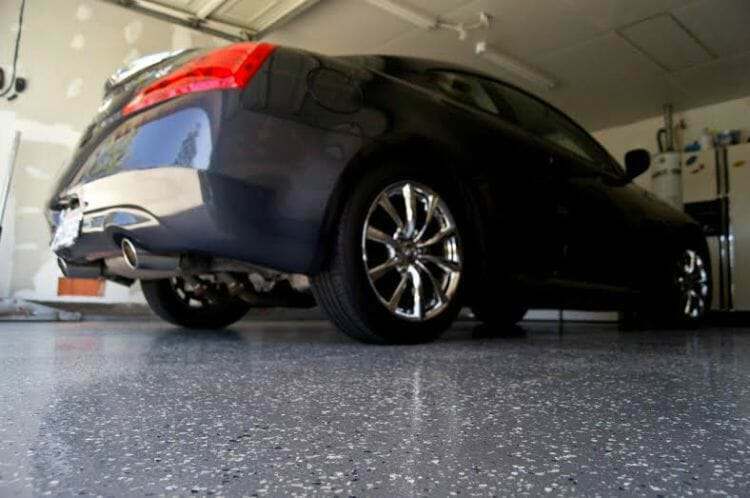 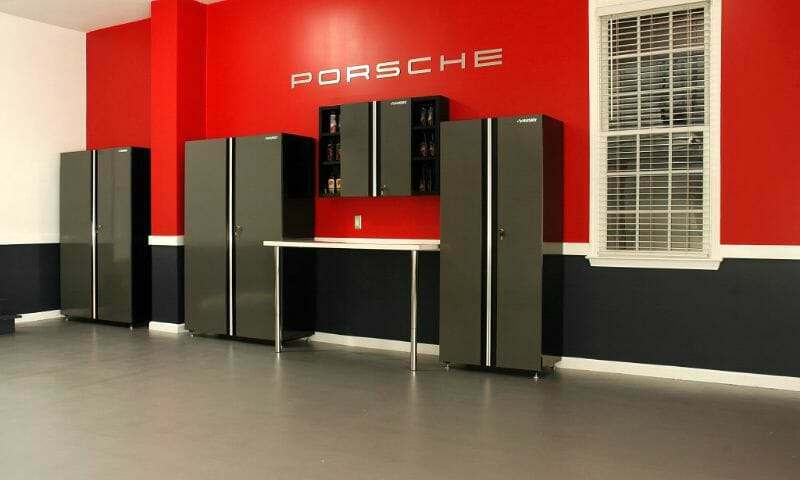 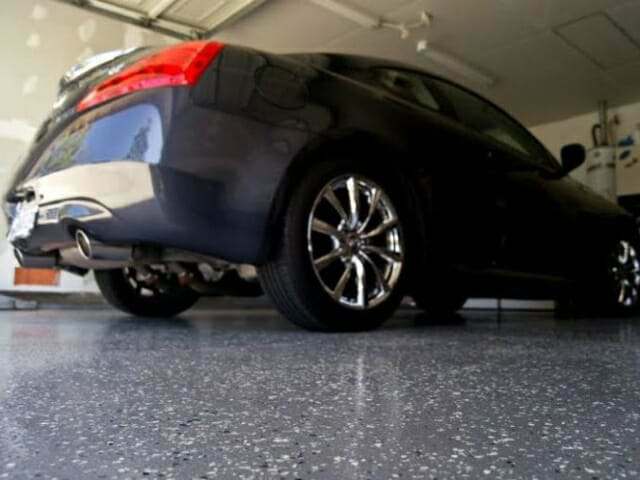 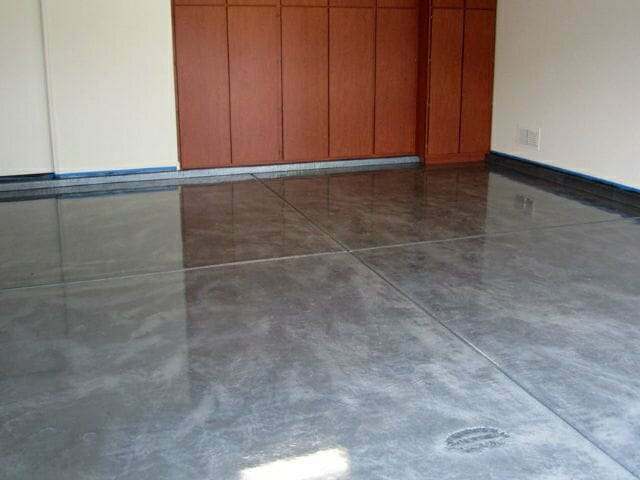 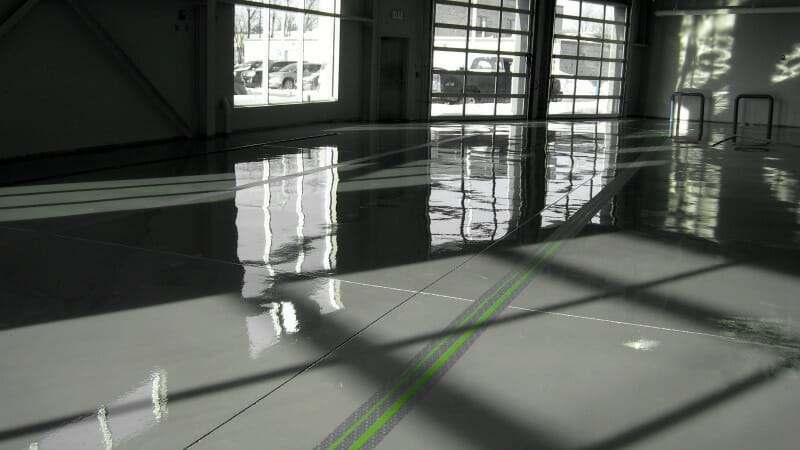 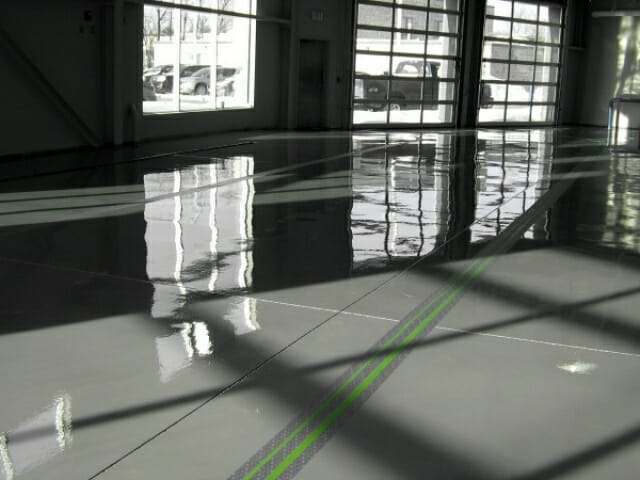 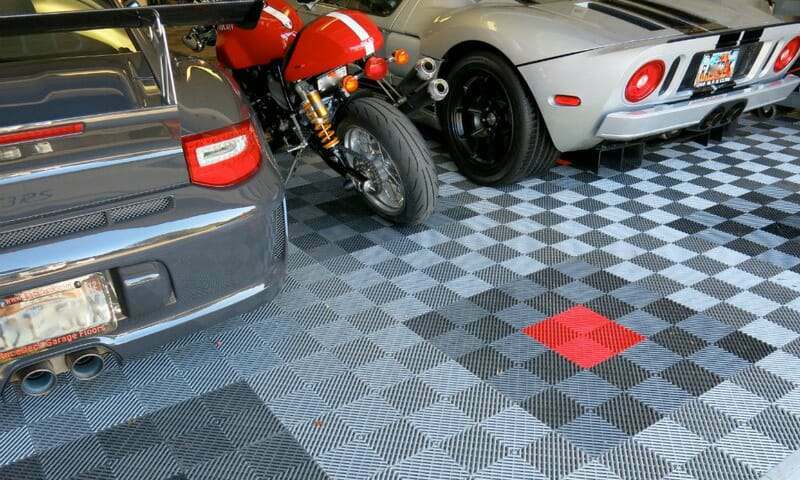 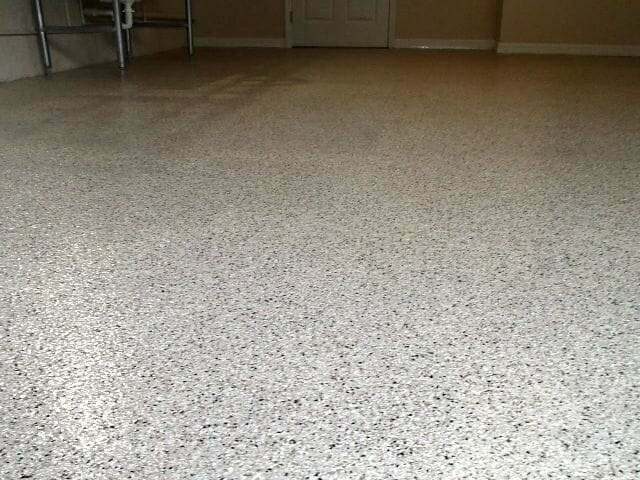 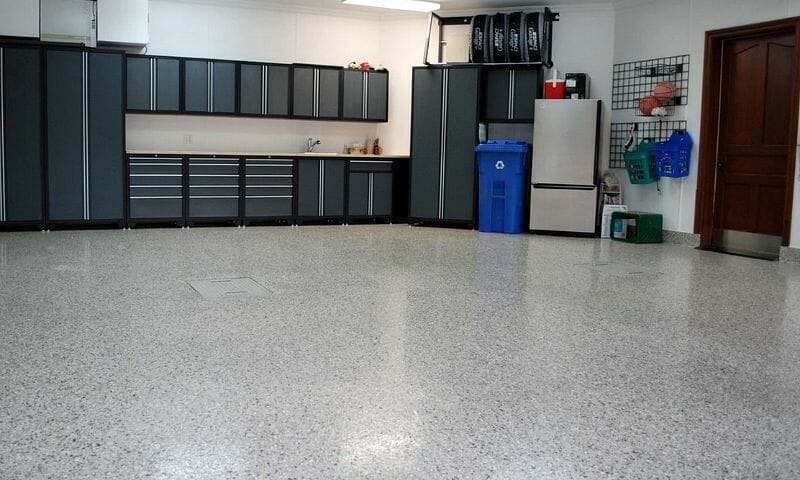 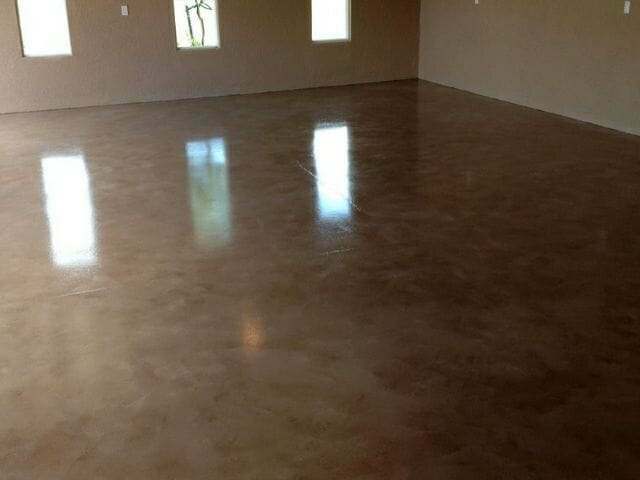 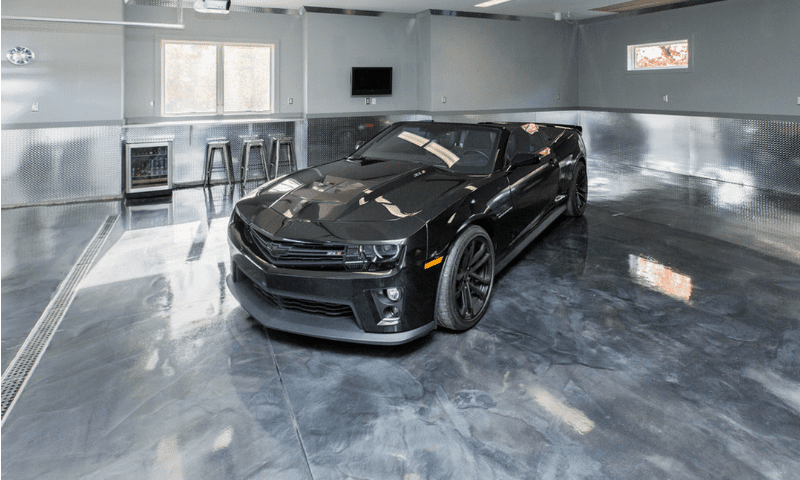 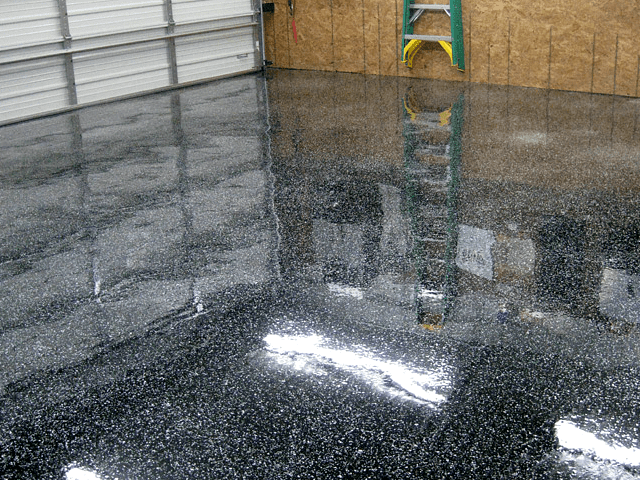 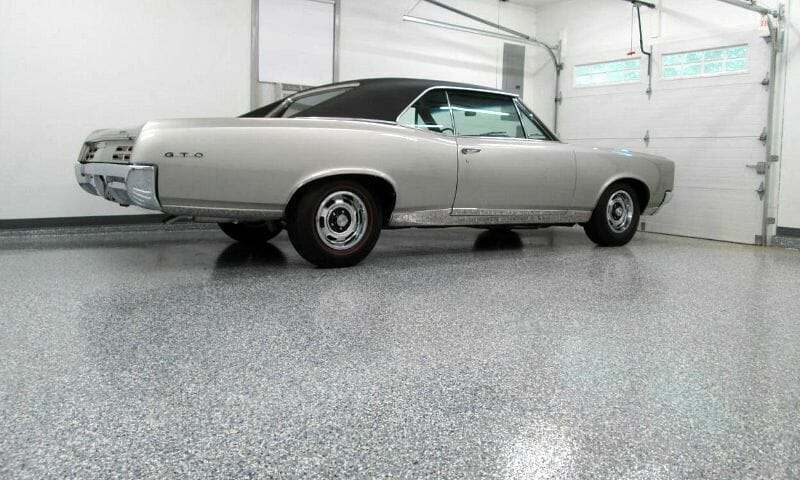 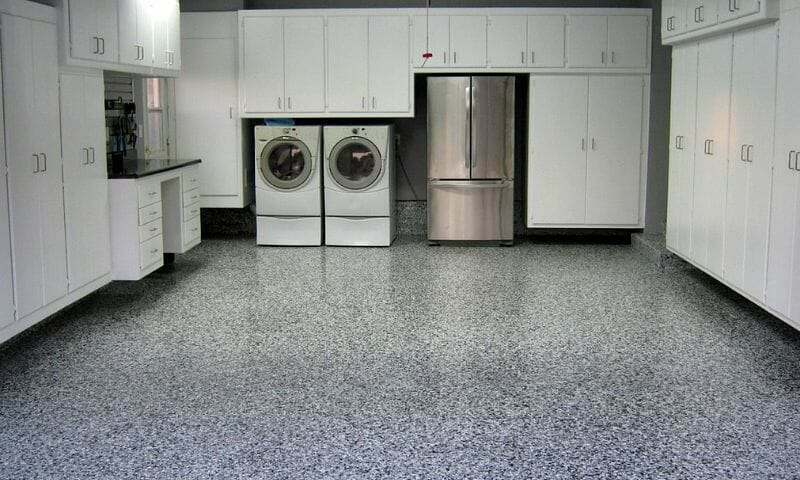 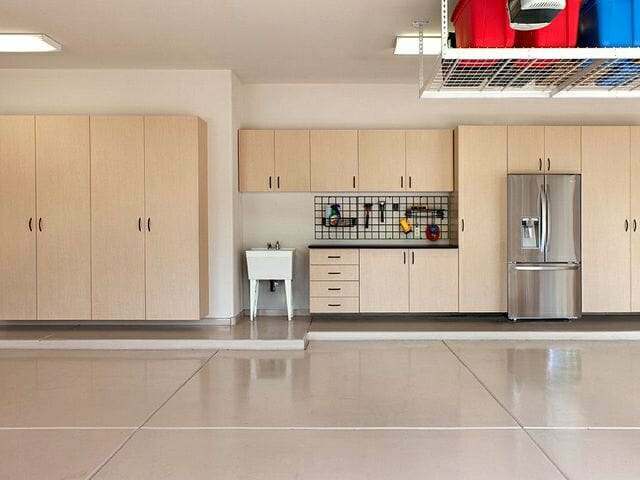 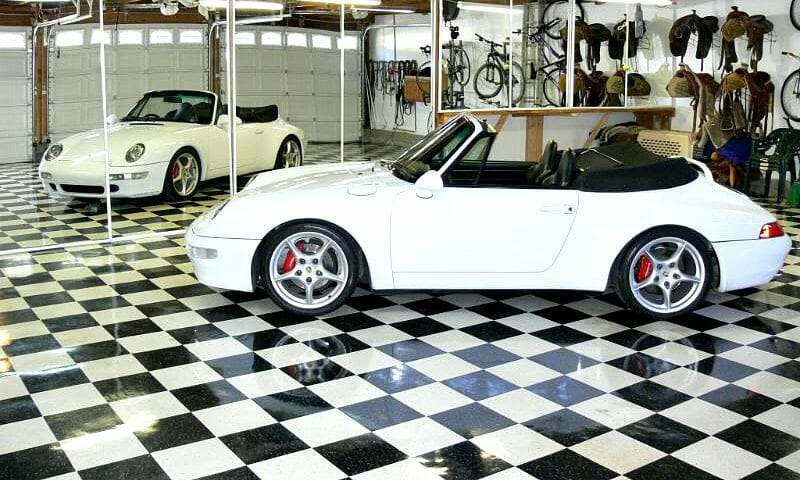 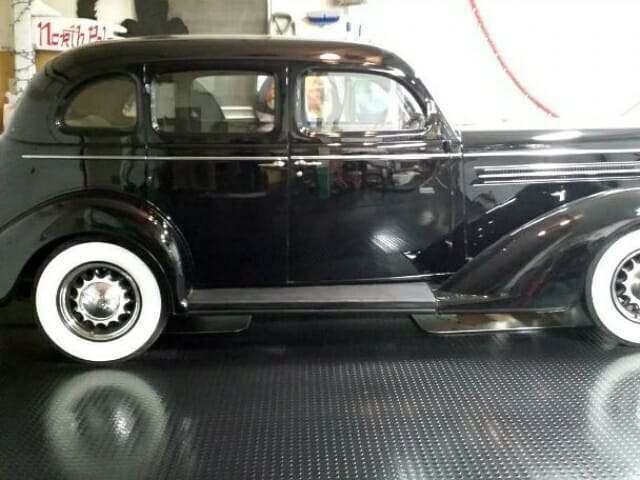 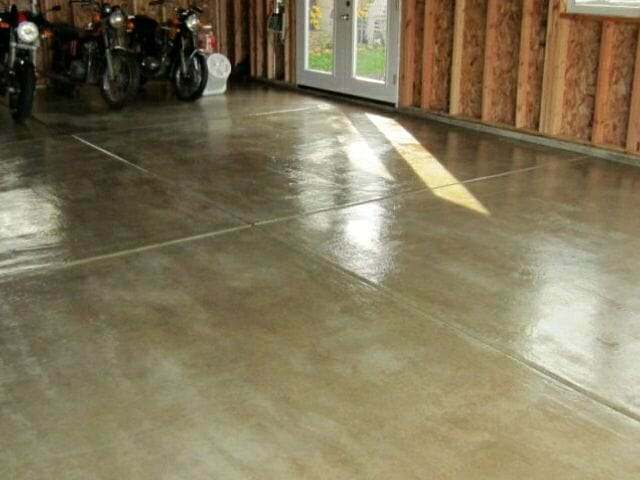 You can also click on the underlined links in the captions if you want to learn more about the type of garage flooring in the picture, where you can find the product, or who may have installed it. 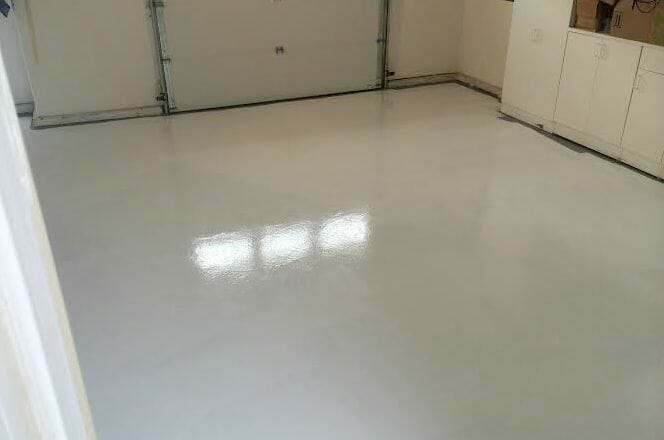 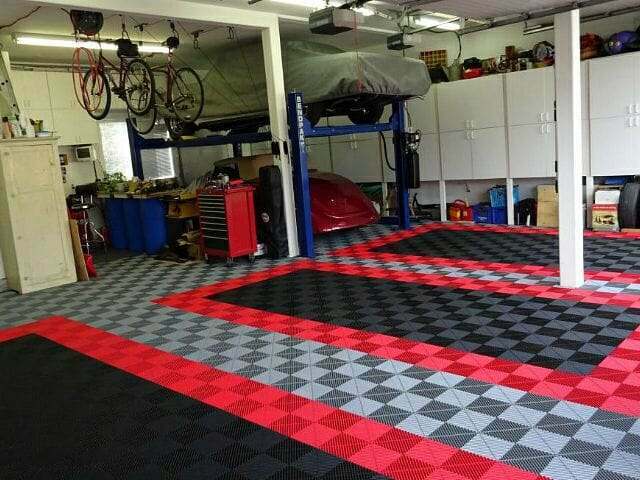 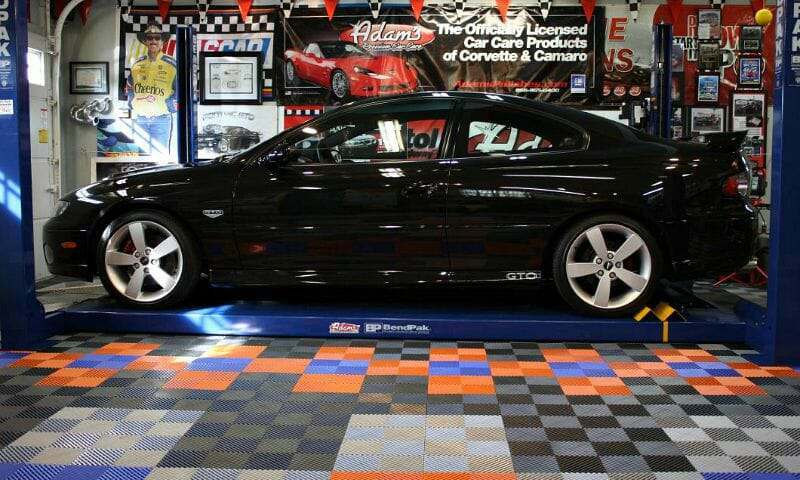 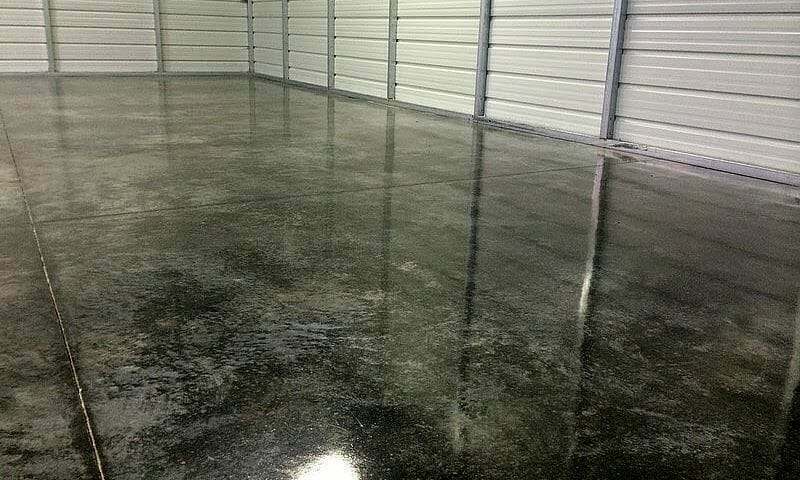 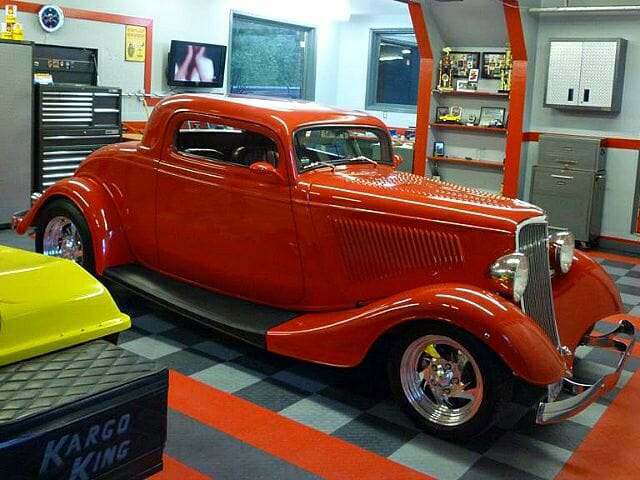 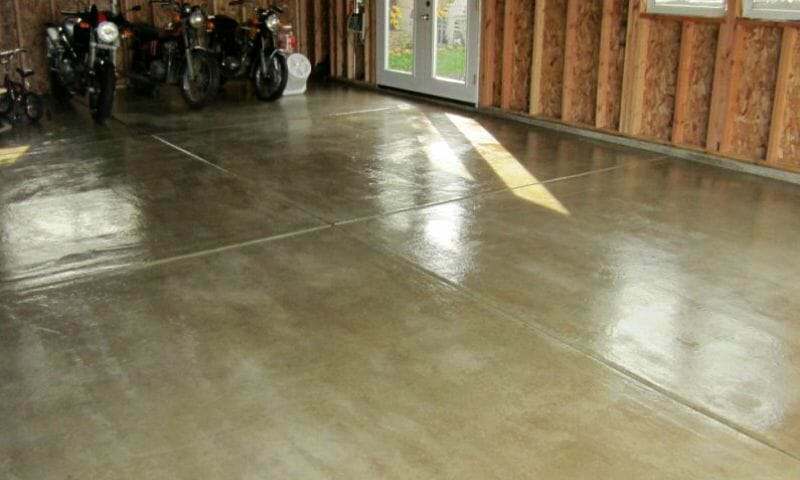 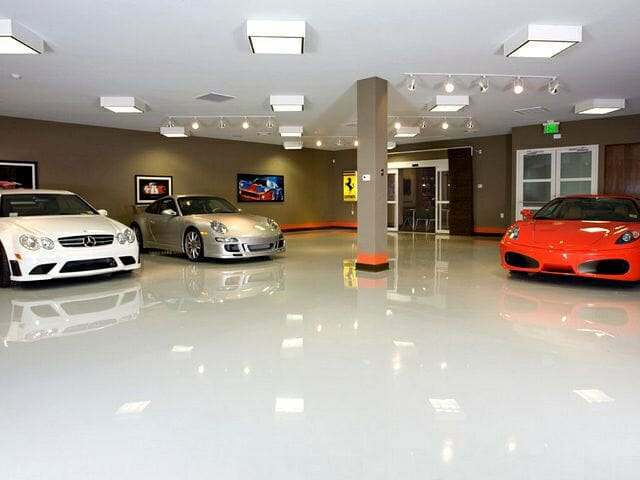 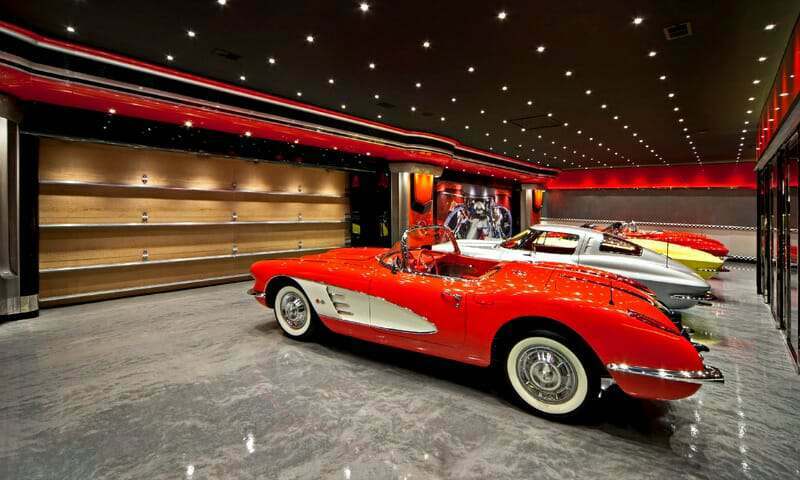 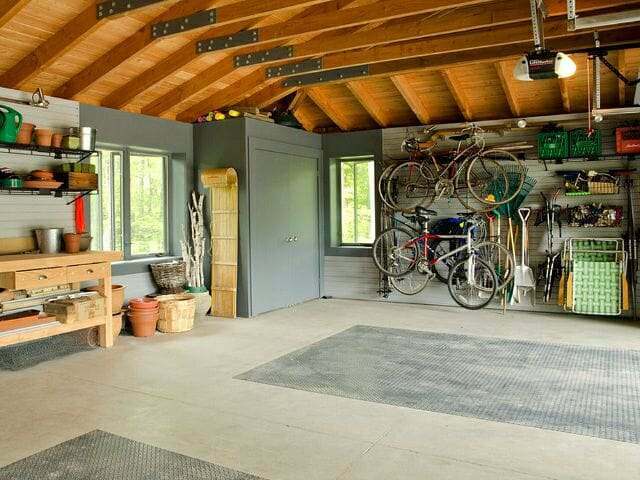 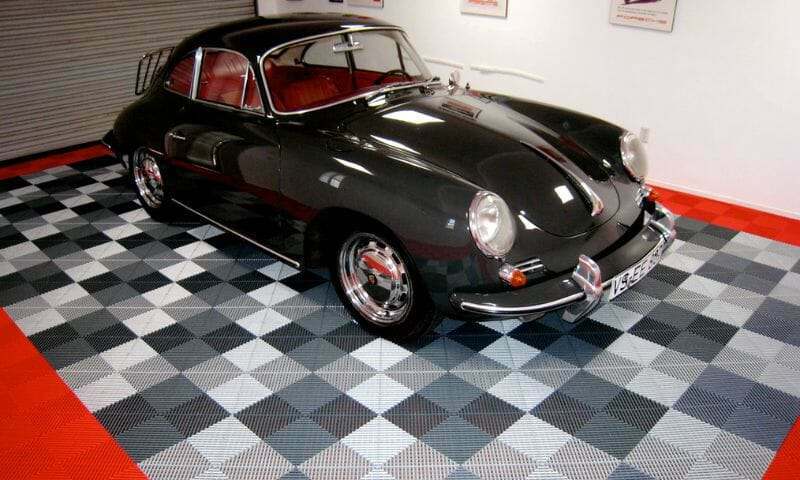 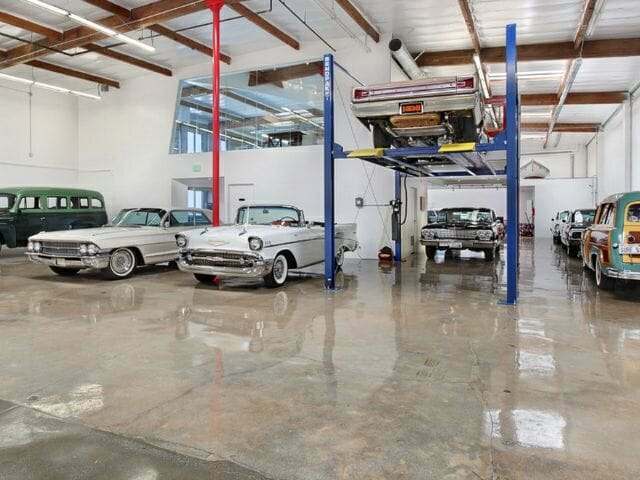 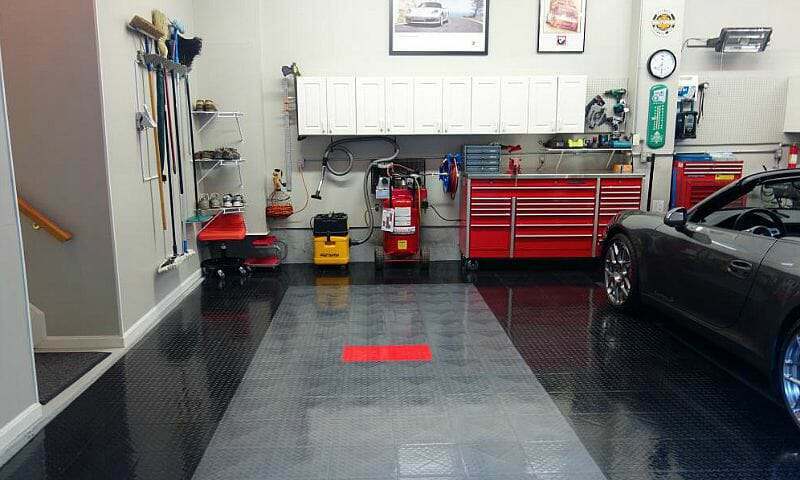 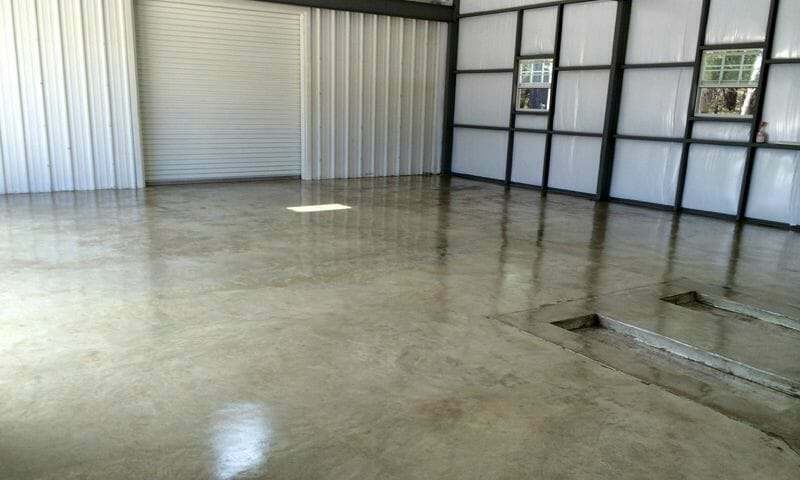 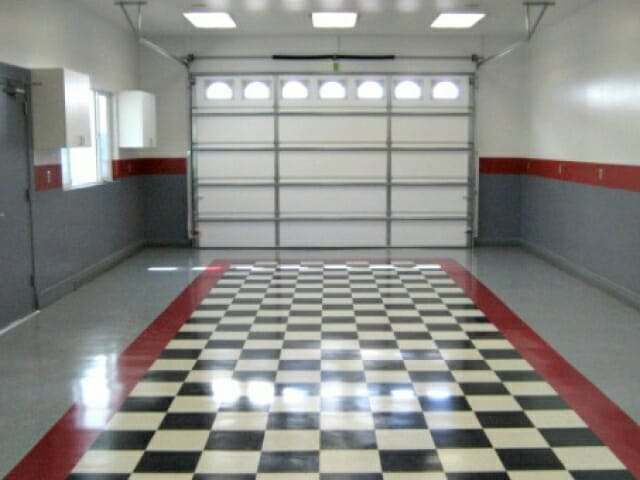 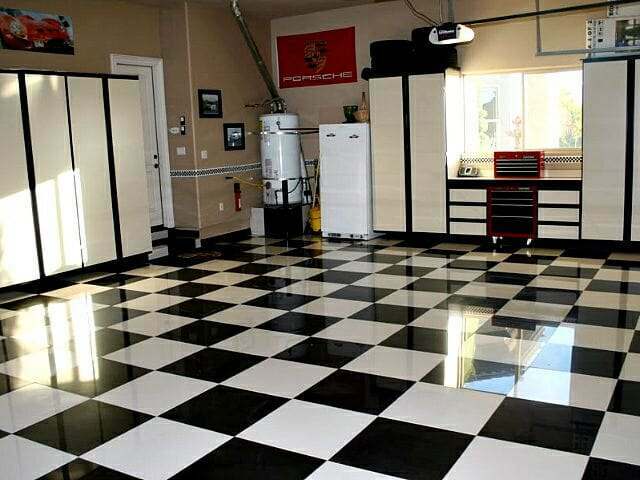 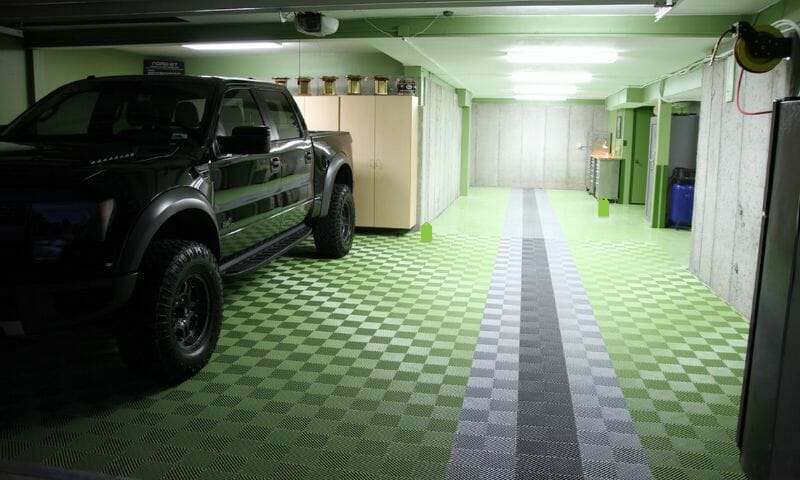 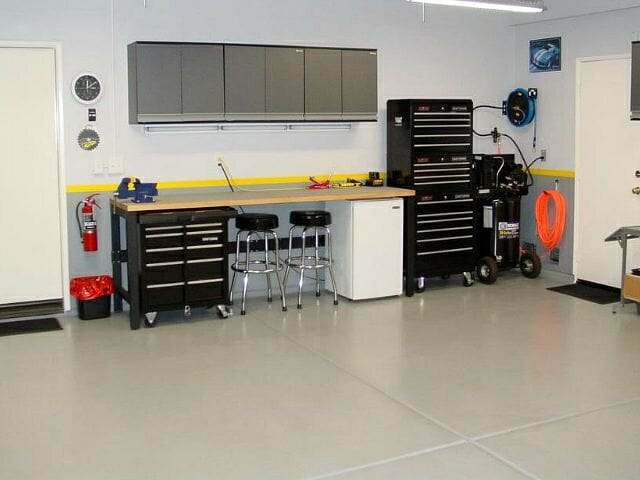 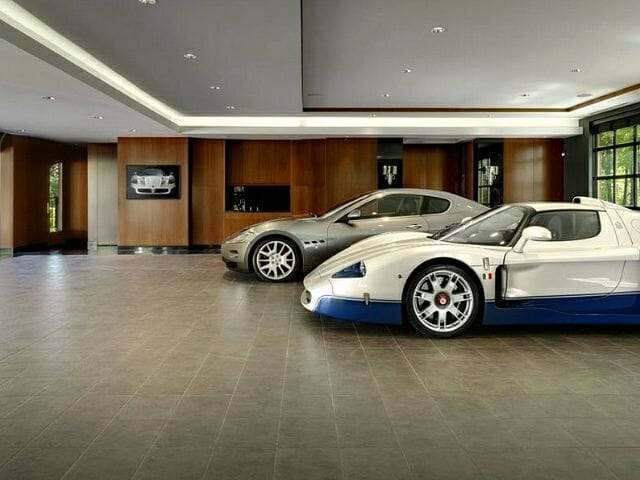 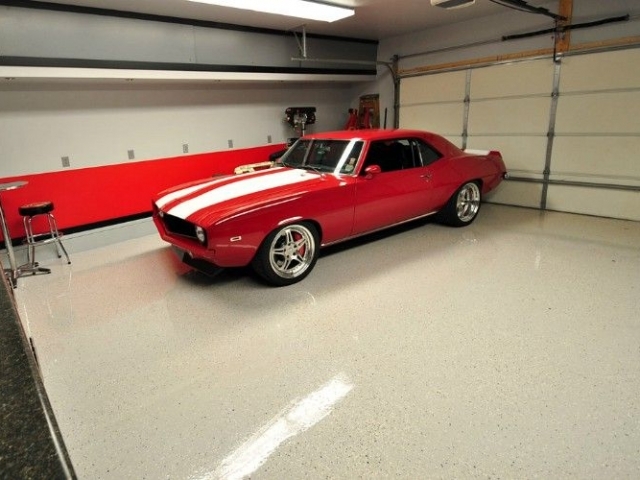 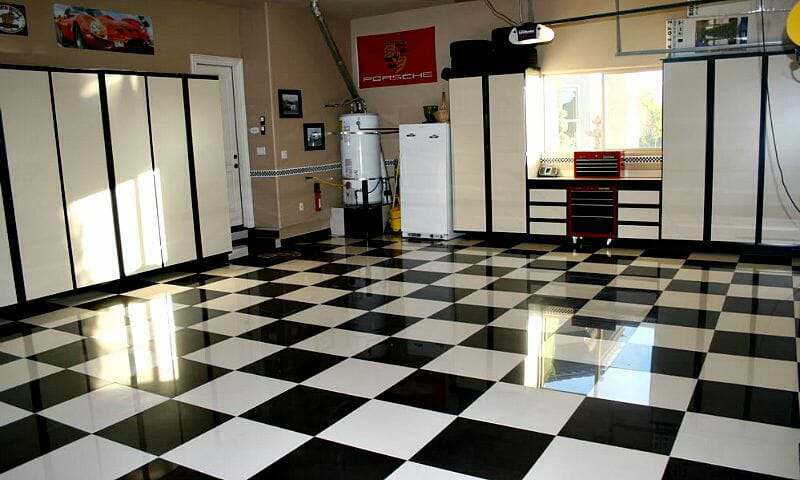 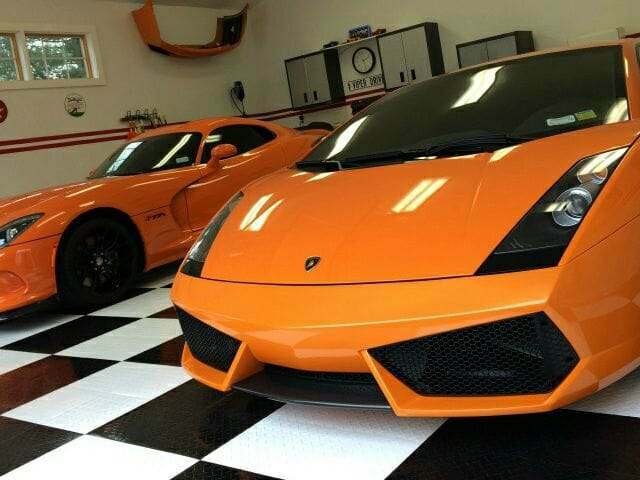 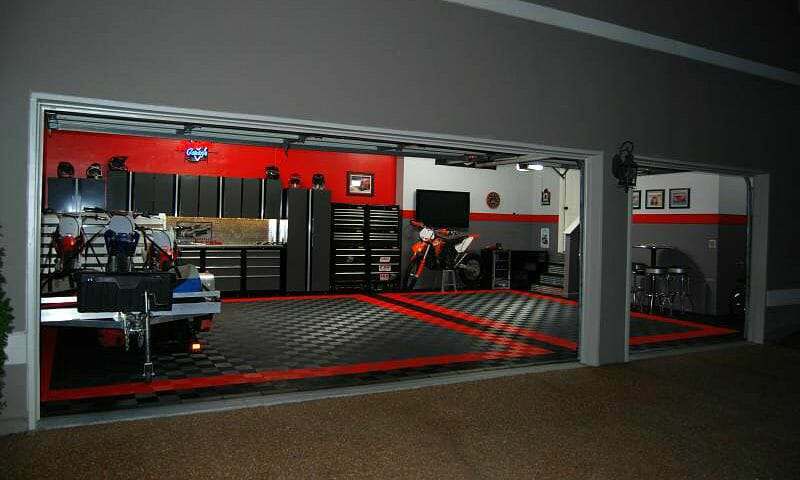 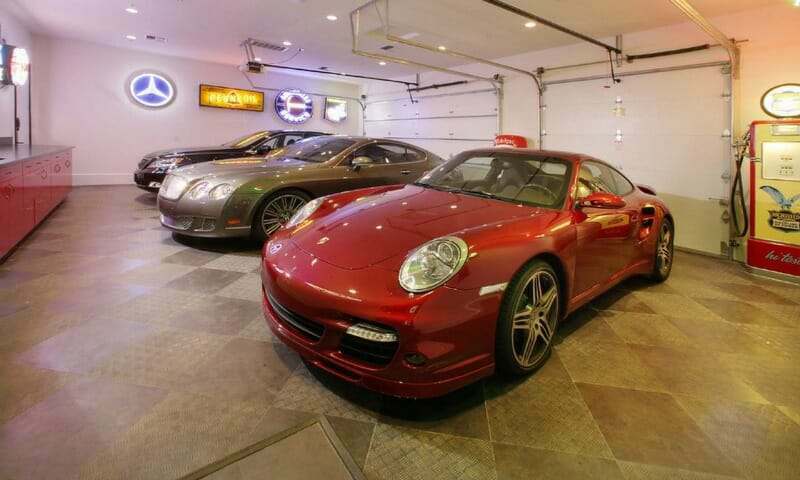 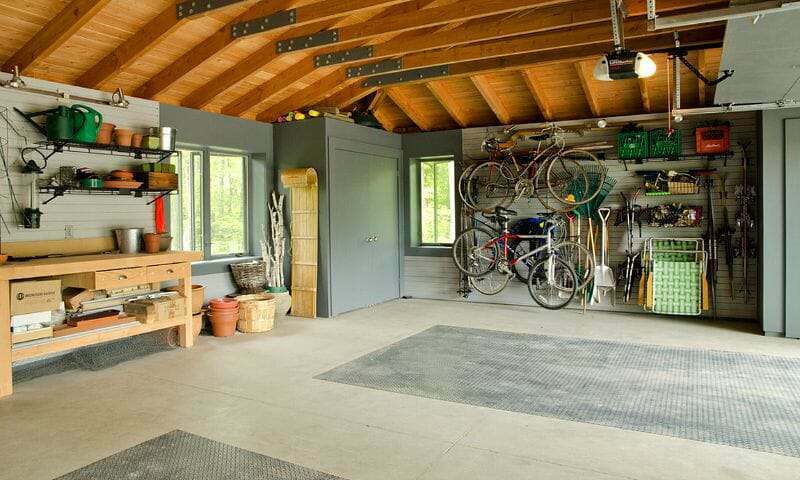 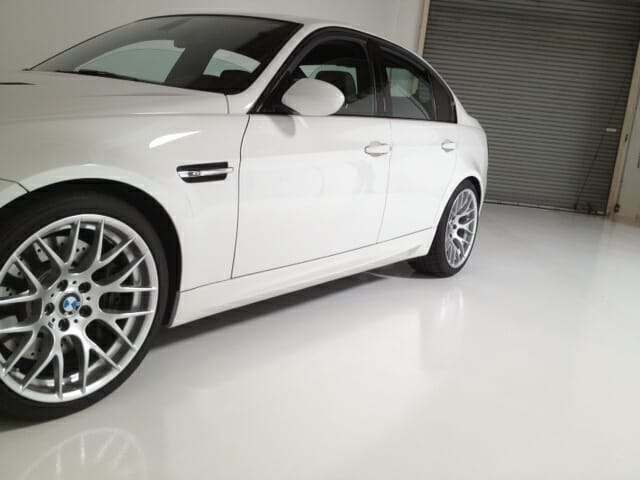 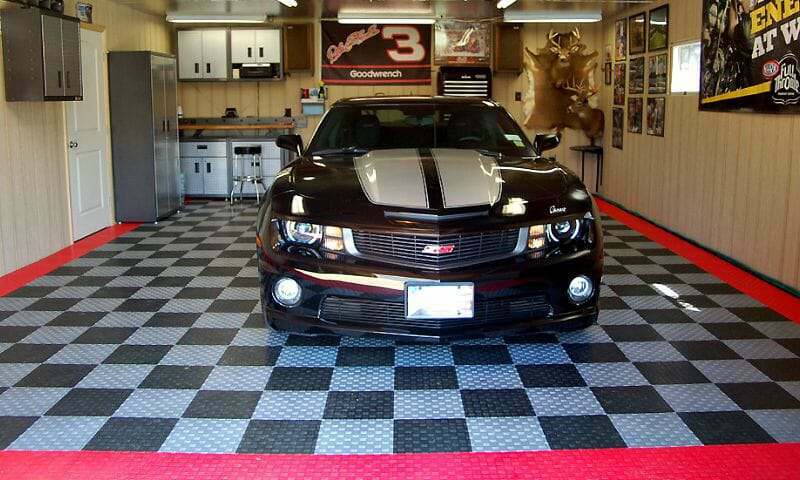 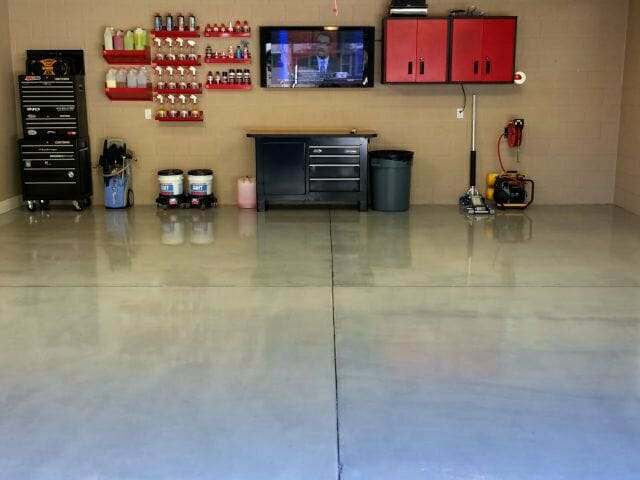 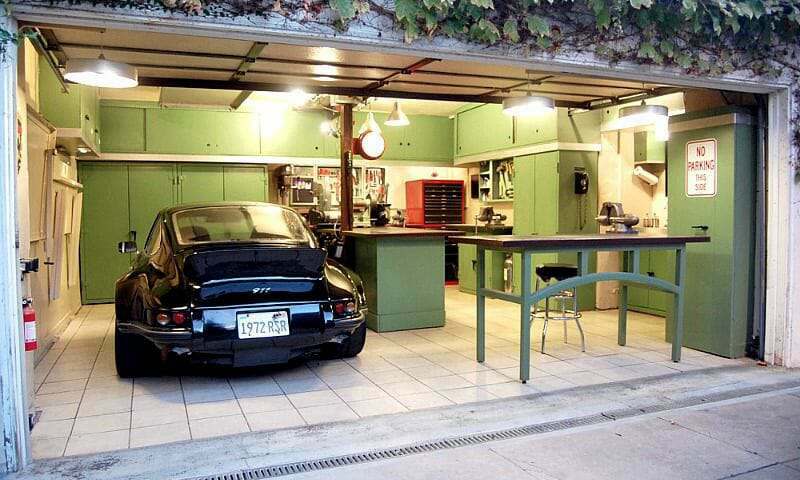 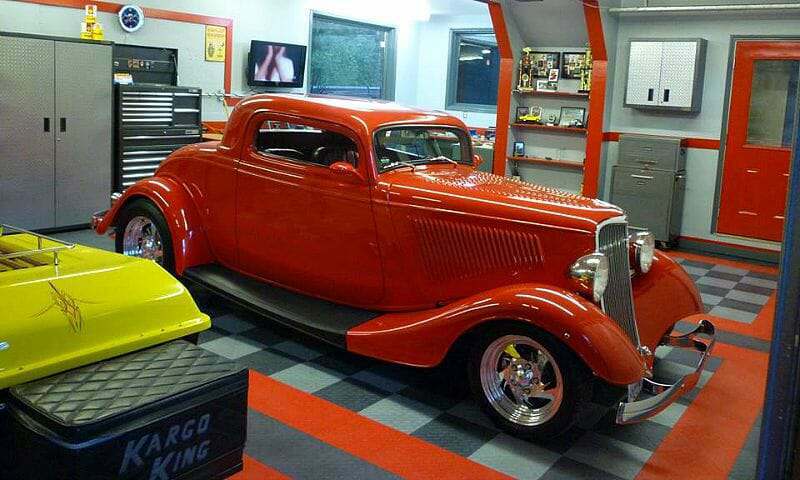 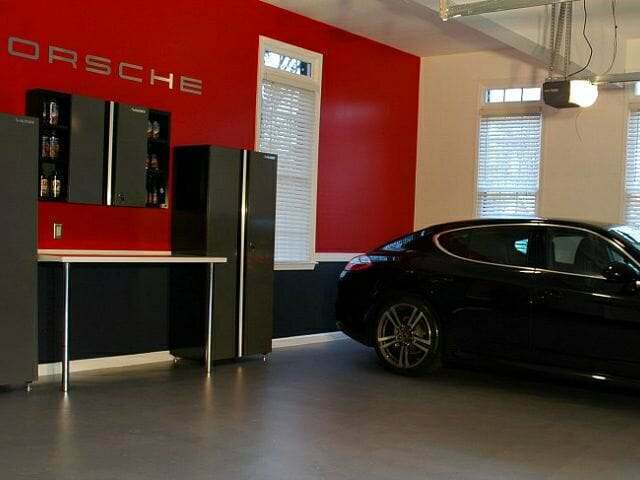 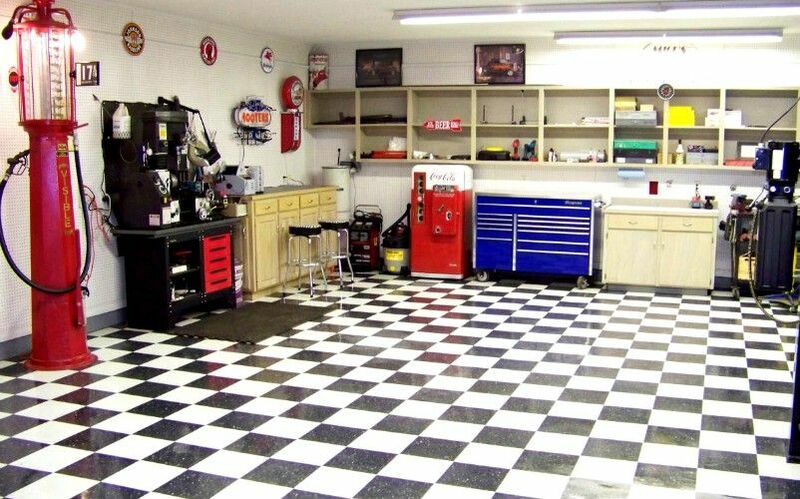 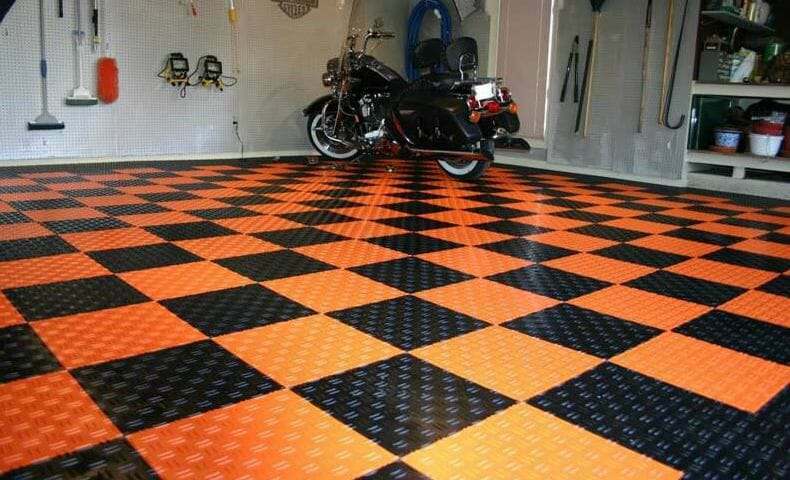 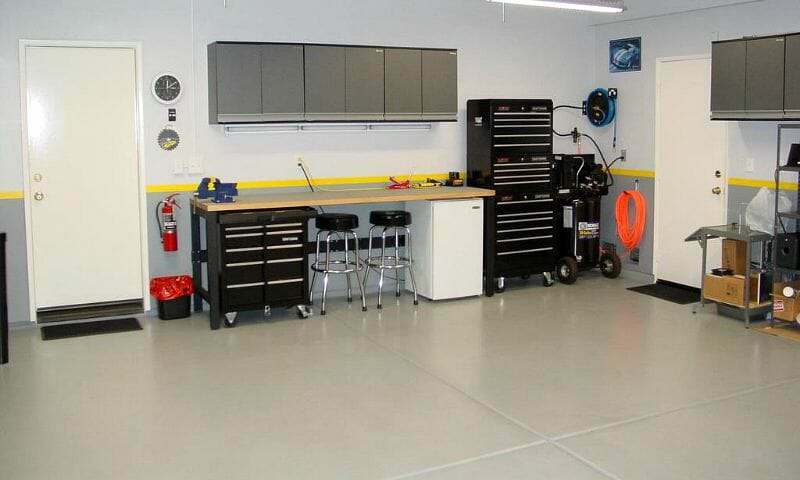 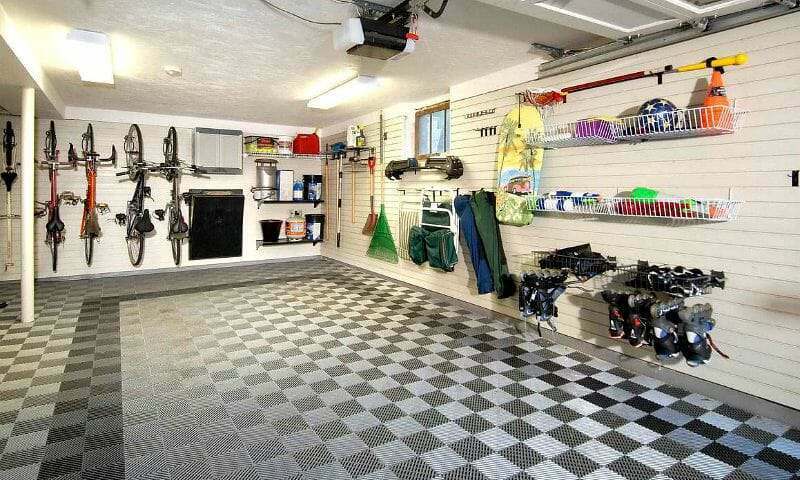 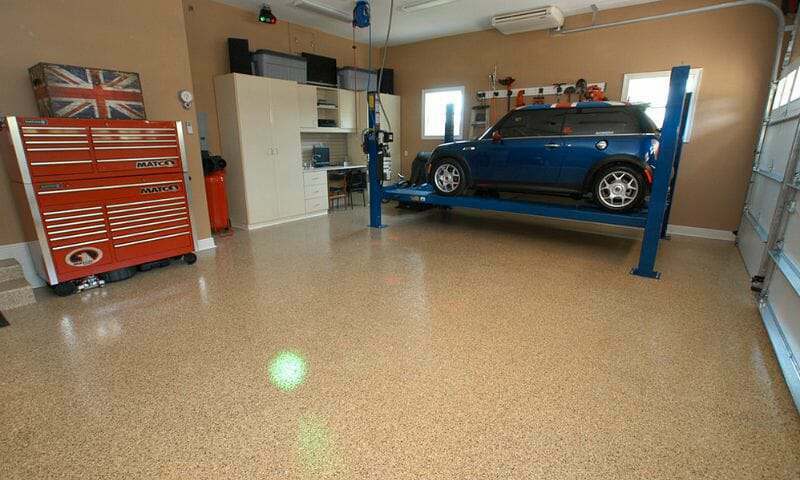 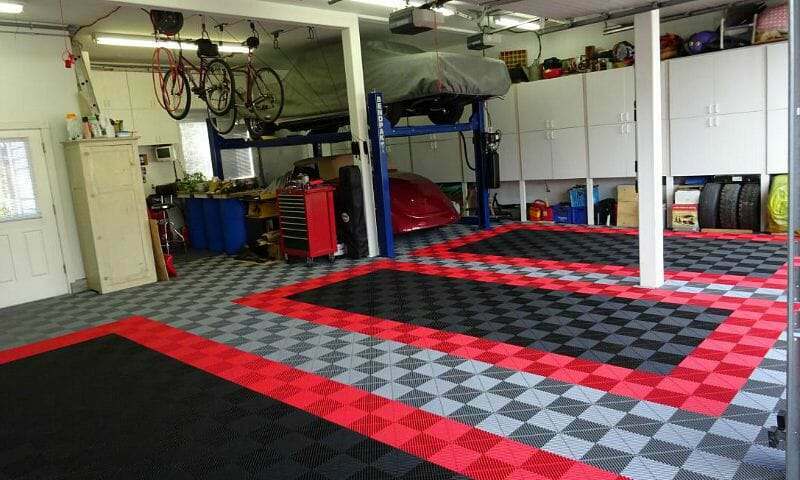 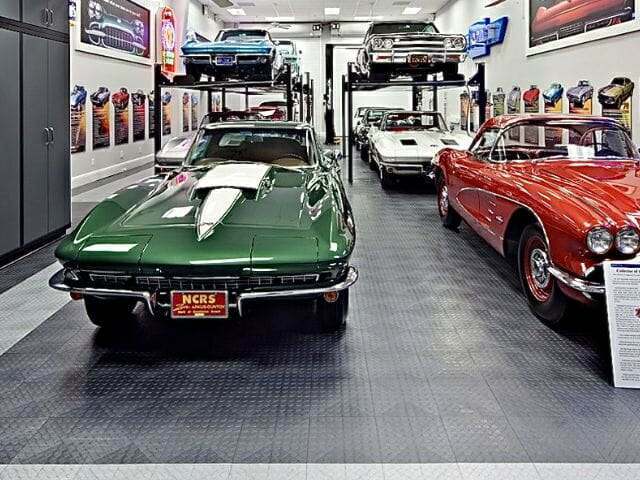 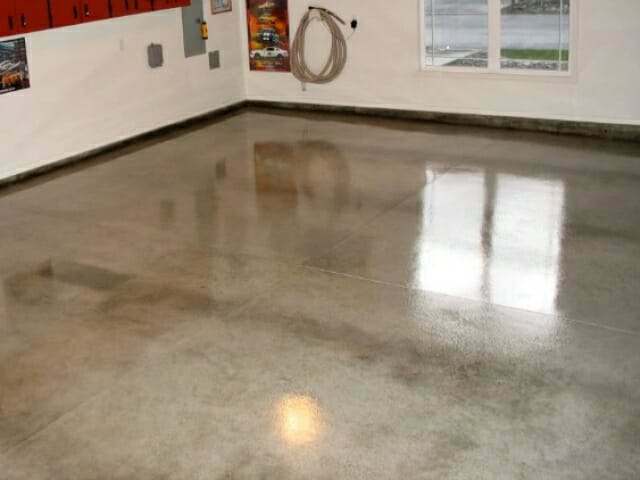 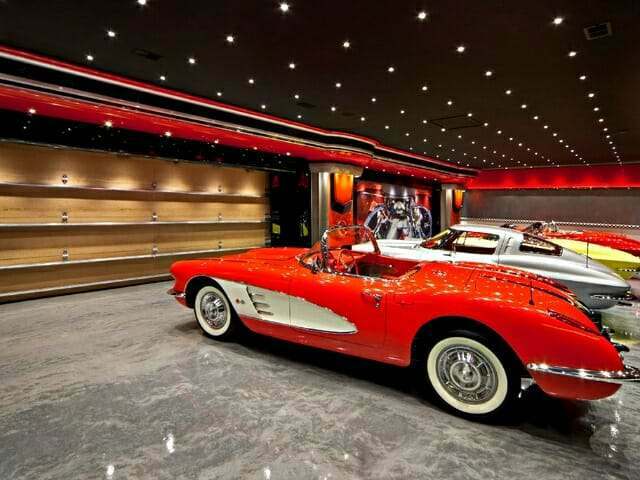 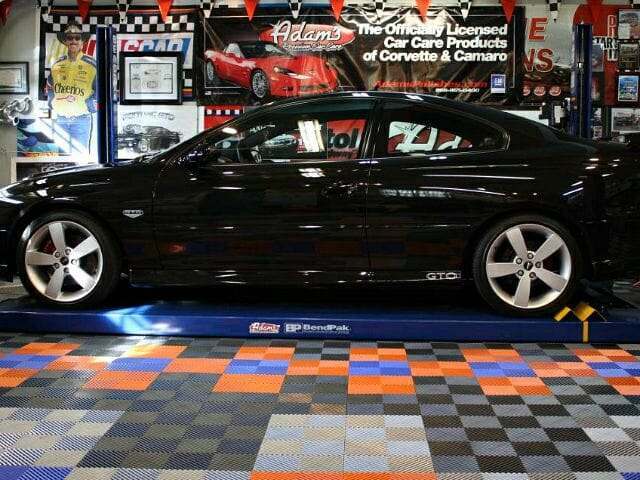 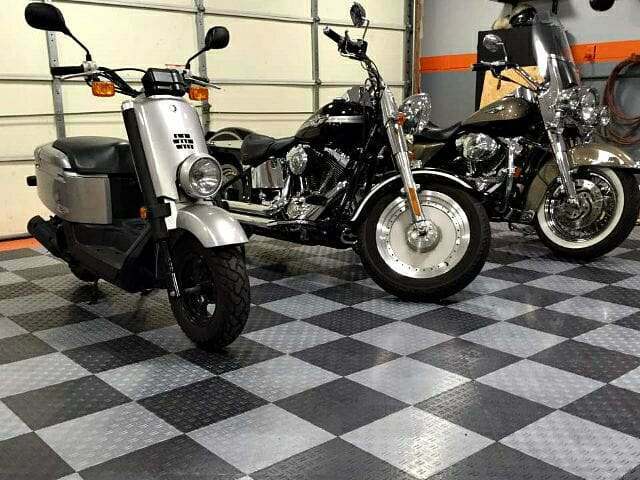 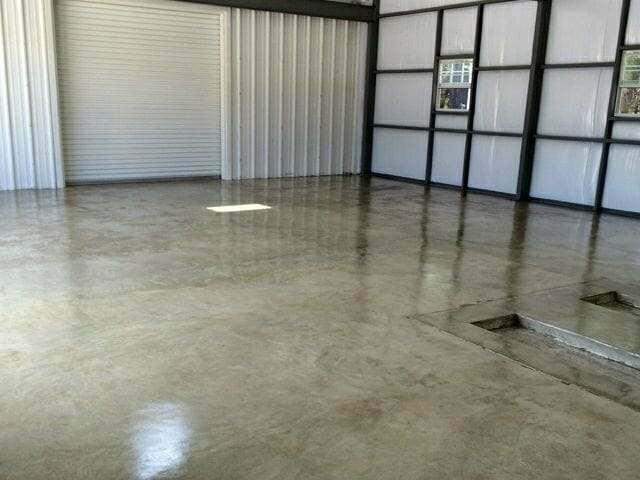 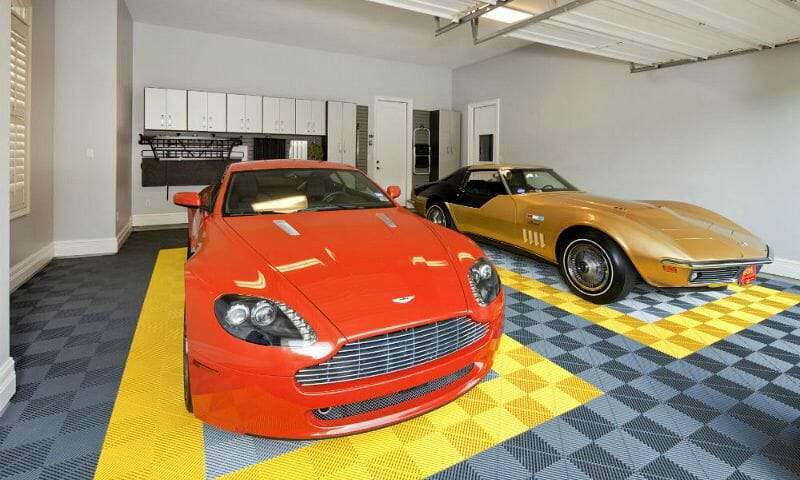 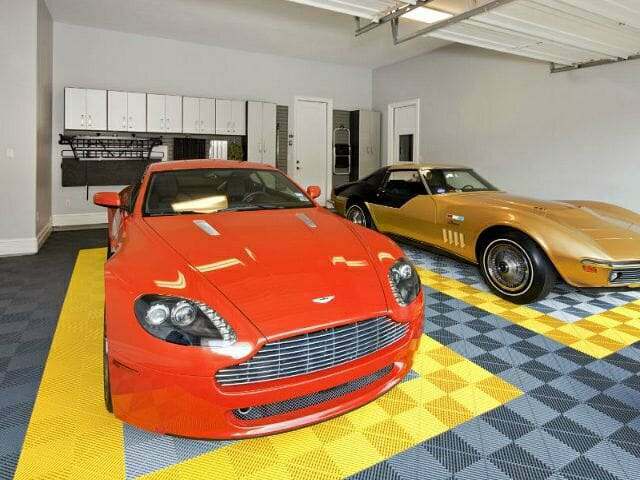 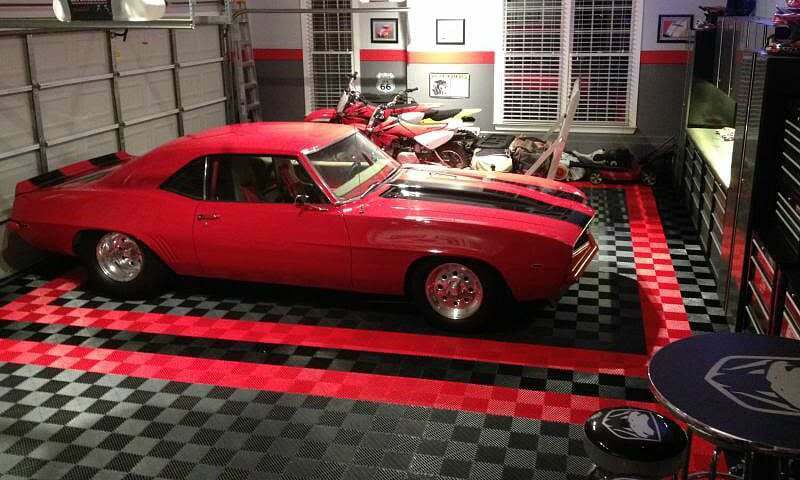 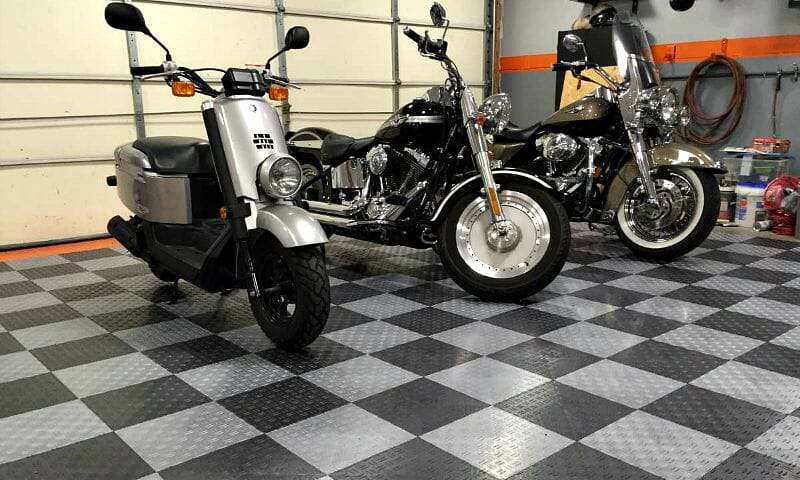 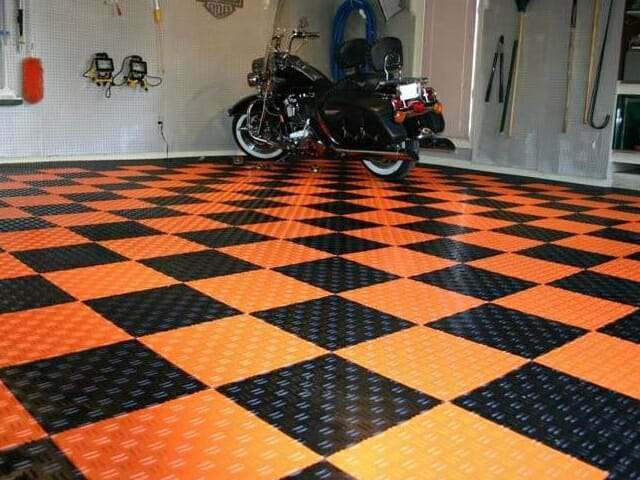 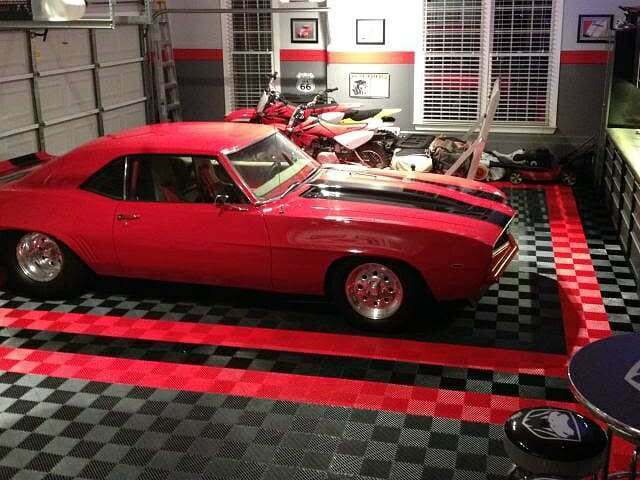 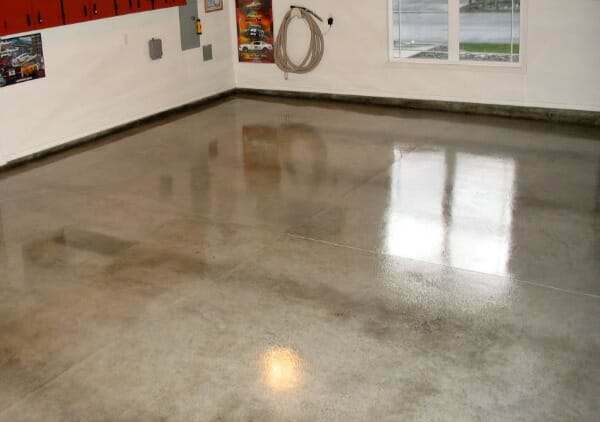 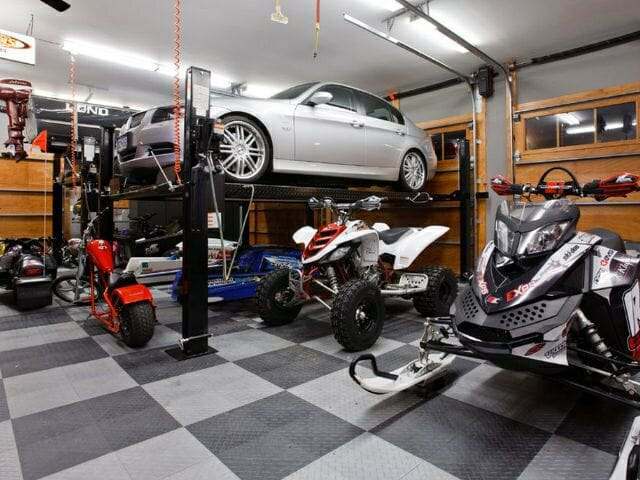 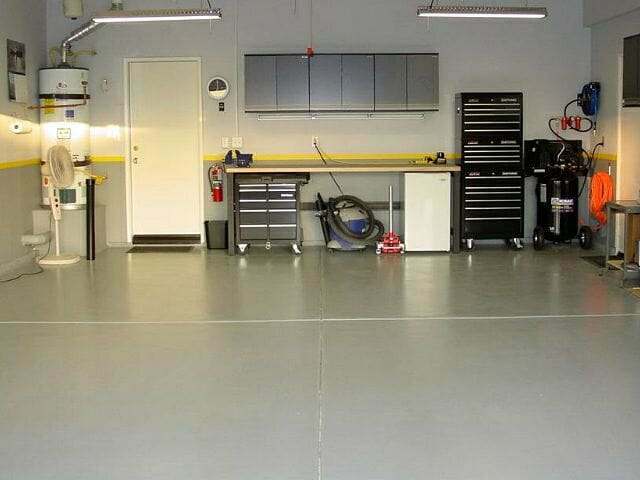 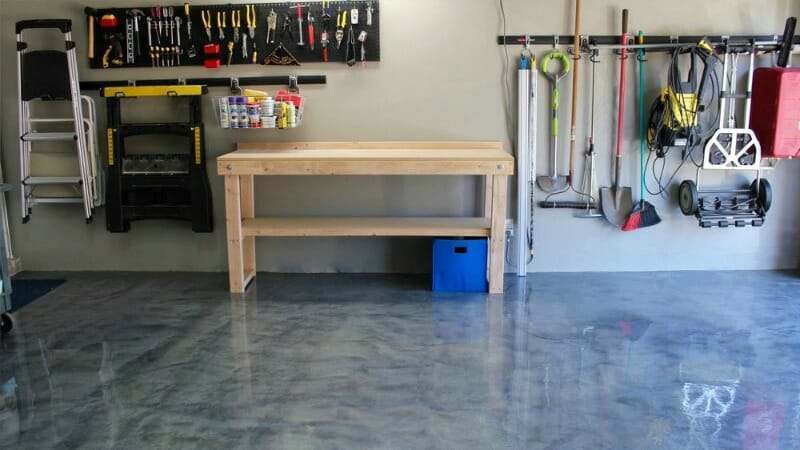 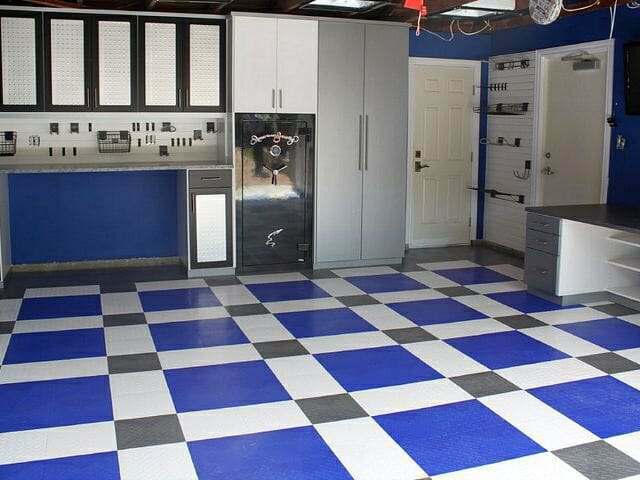 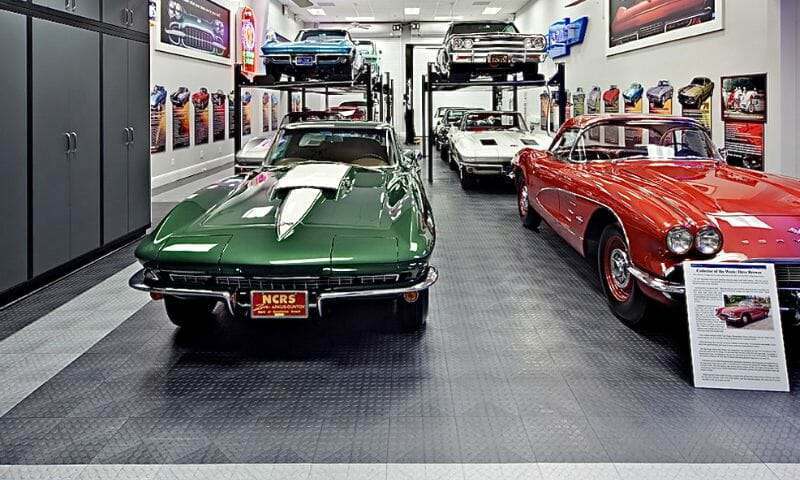 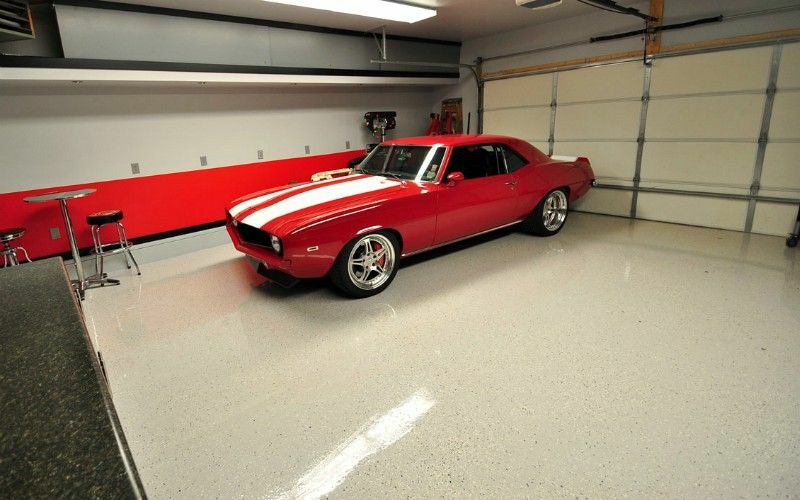 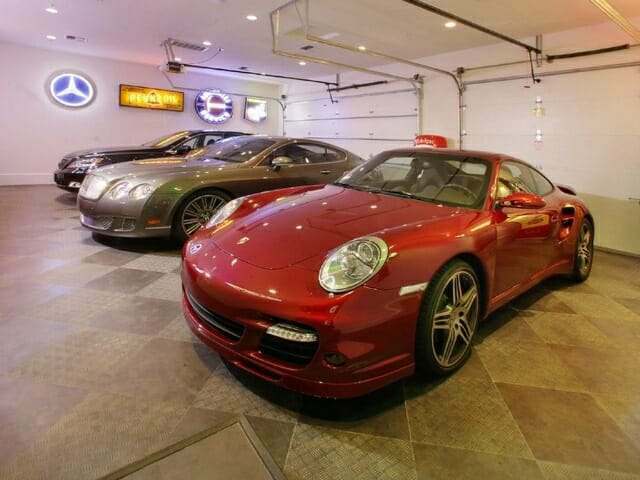 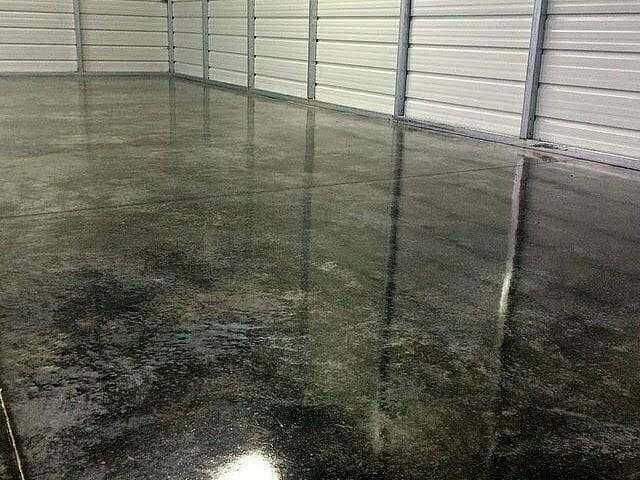 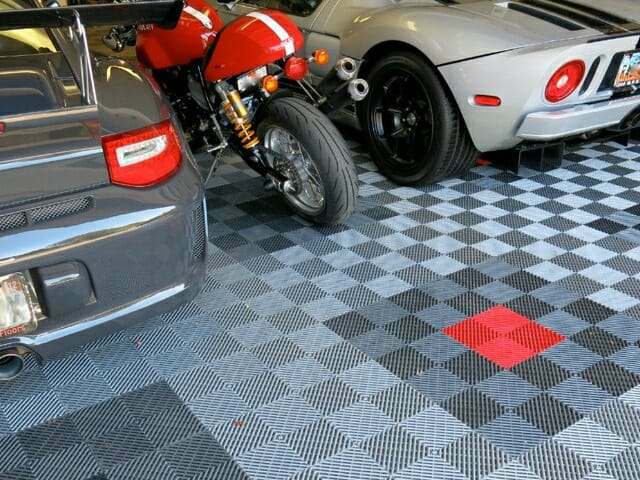 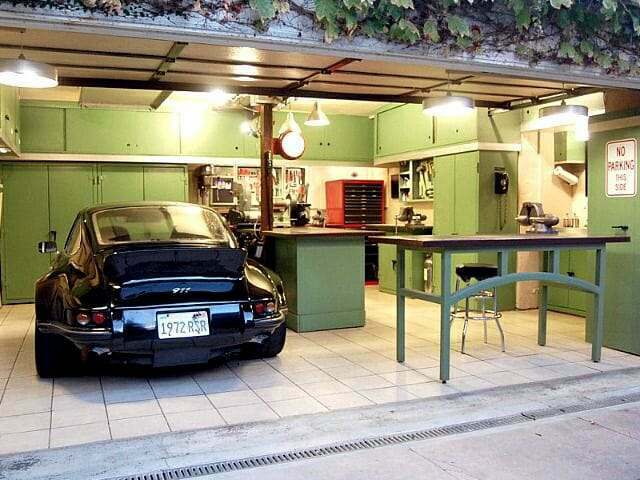 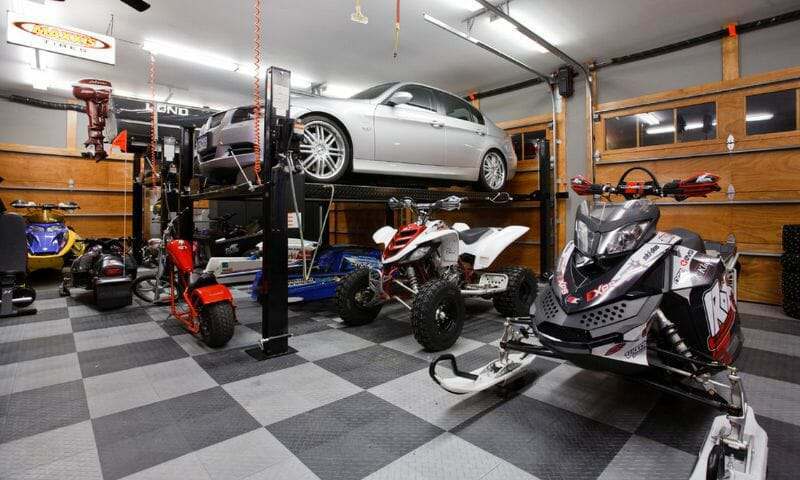 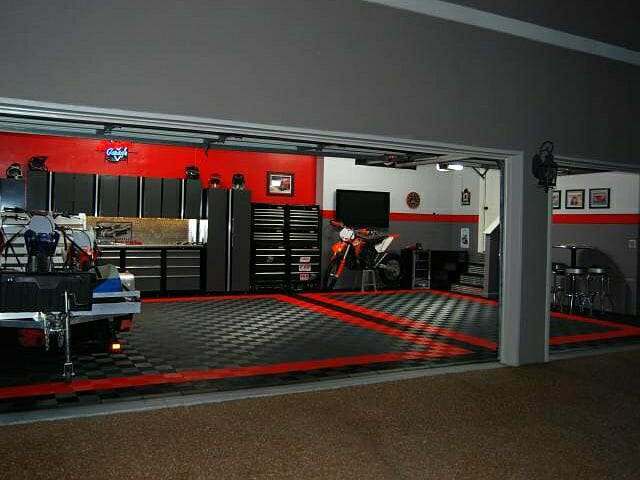 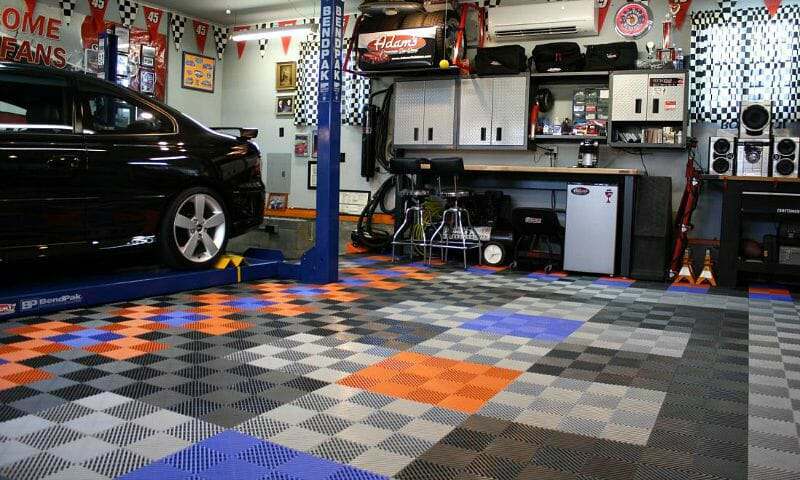 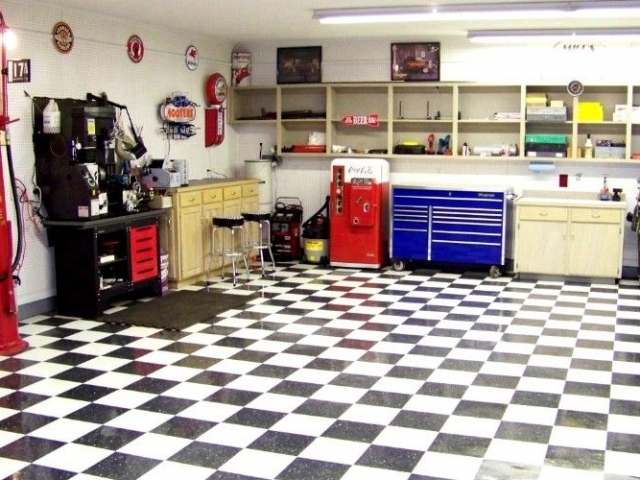 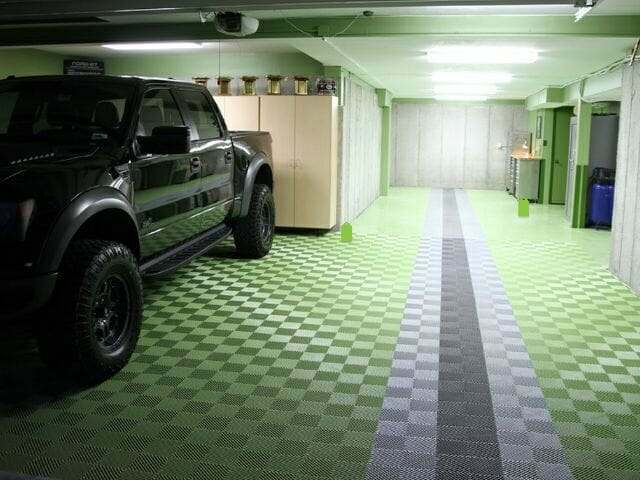 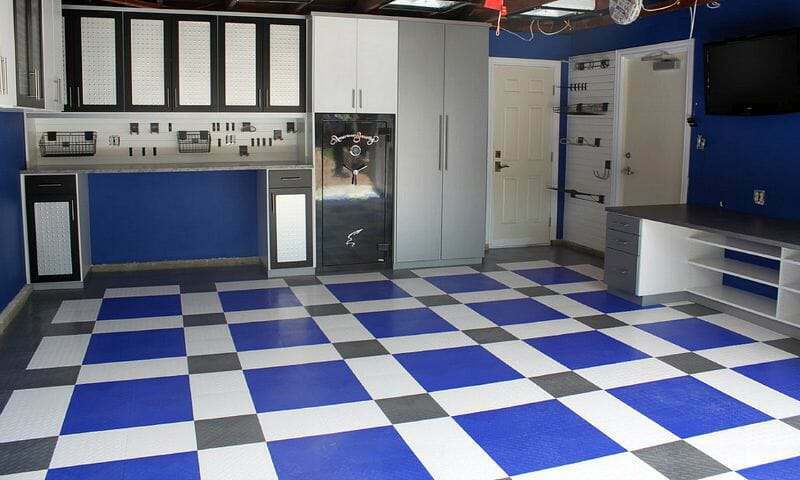 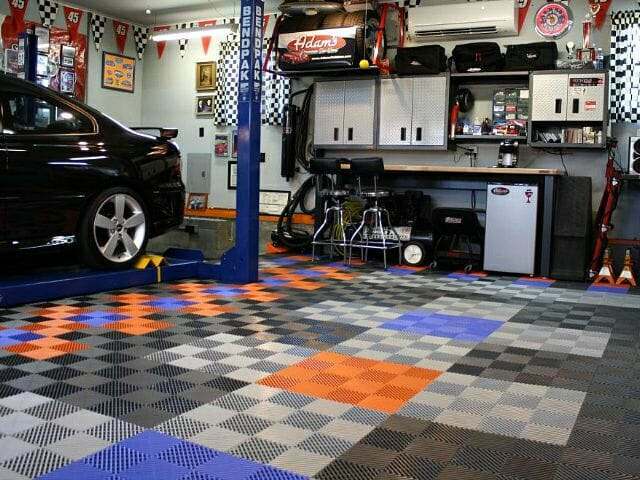 If you have a garage floor that you are proud of, you can submit us your pictures here to include in our gallery. 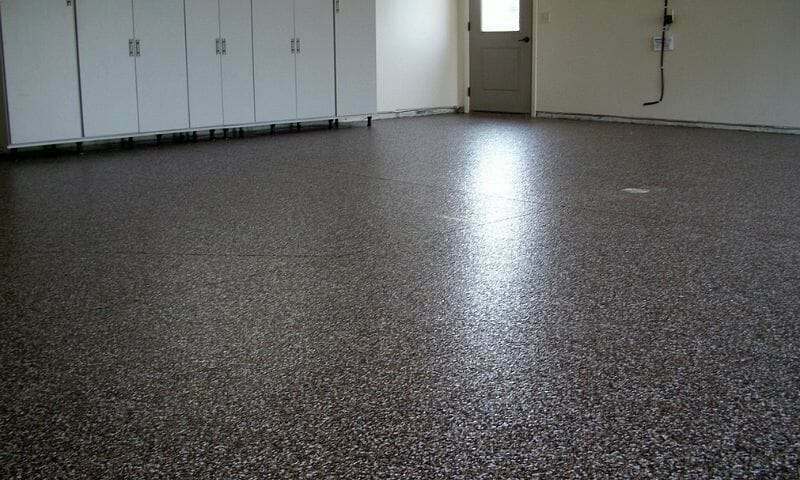 Please tell us what type of flooring it is, whether it was installed by yourself or someone else, and where you may have purchased it. 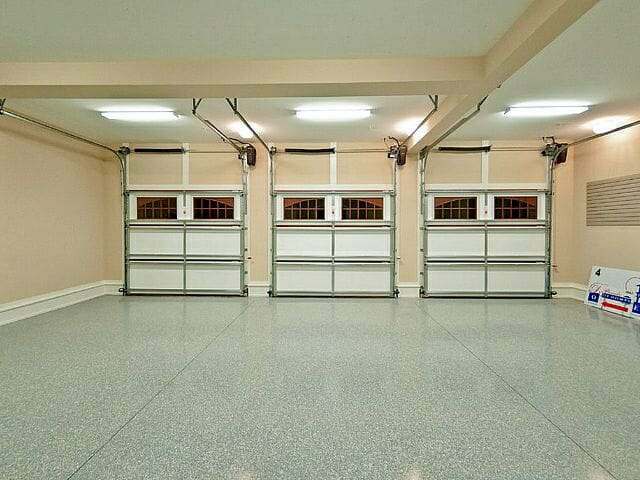 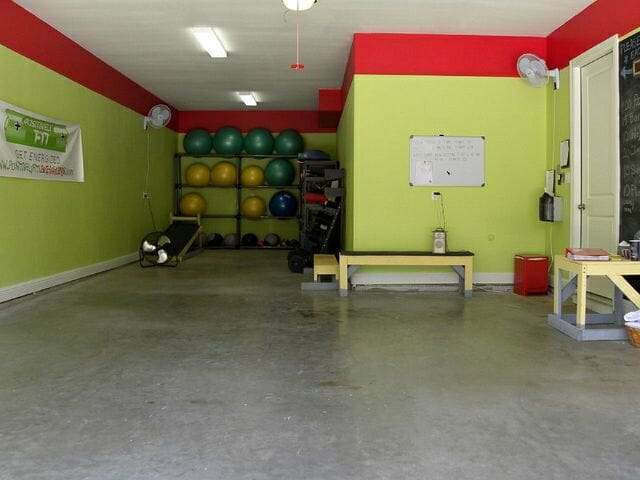 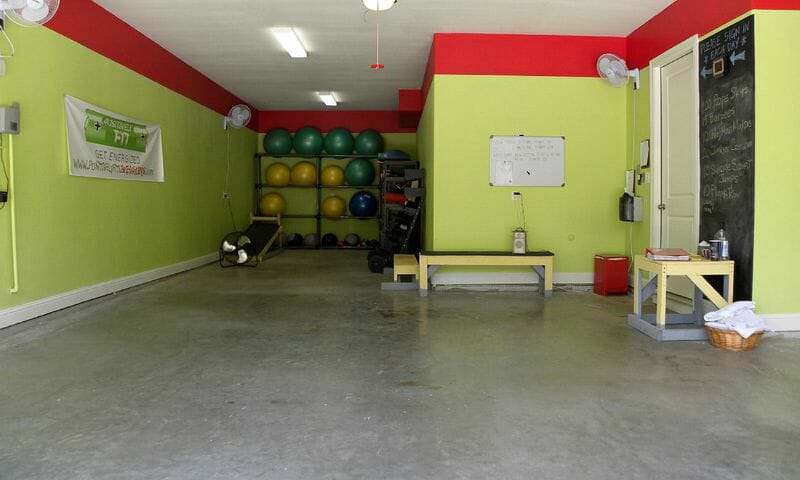 Please make sure your garage floor pictures are clear and at least 800px wide. 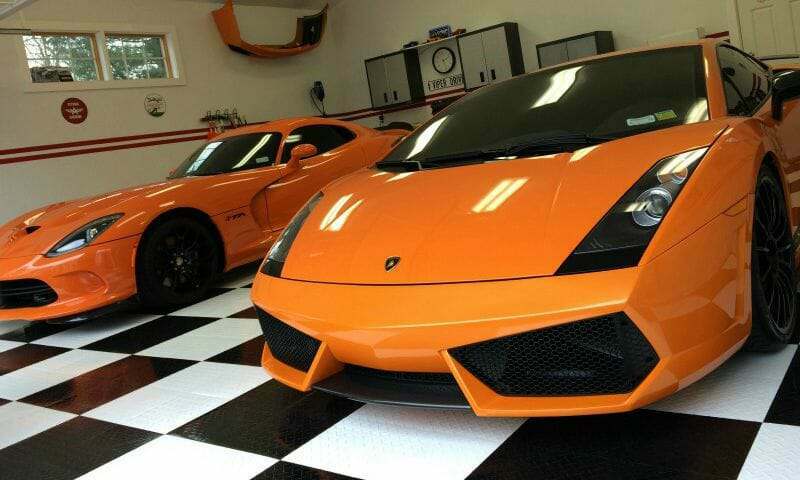 Larger is fine as we can edit them to size. 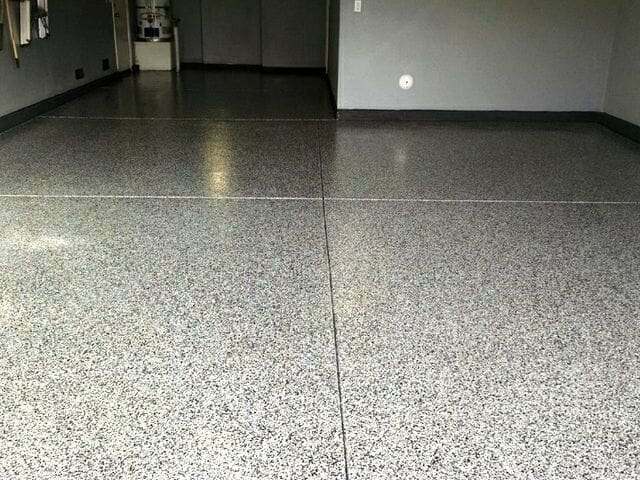 I have installed one coat of Rocksolid Polycuramine garage floor covering, i want happy with the amount of chips i broadcast , so what i did was put the clear coat on and added plenty of chips , looks great now ! 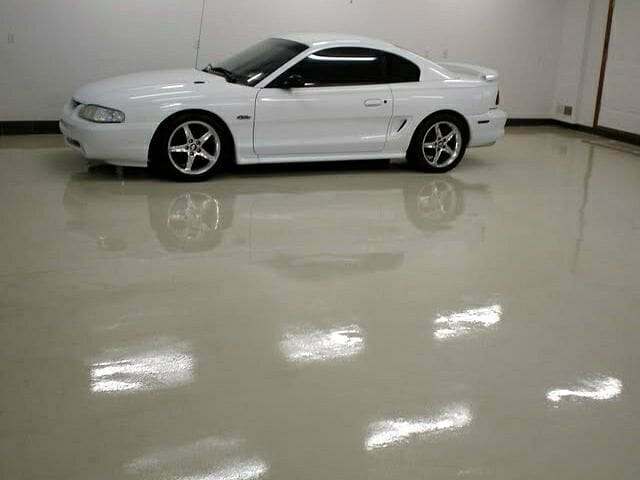 question is , can i put another layer of Rocksolid clear topcoat on ? 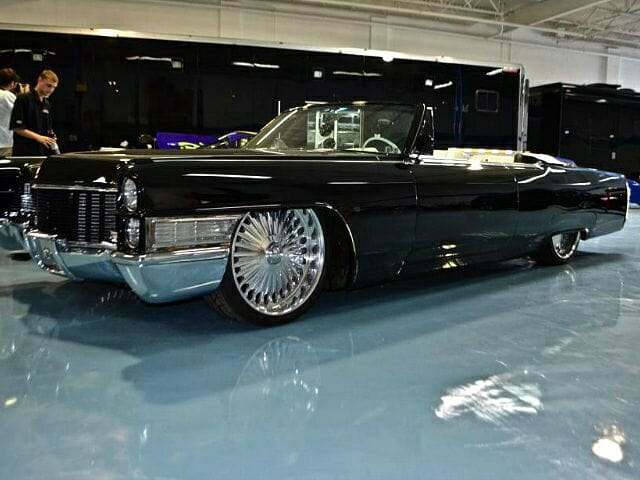 Yes you can Chris! 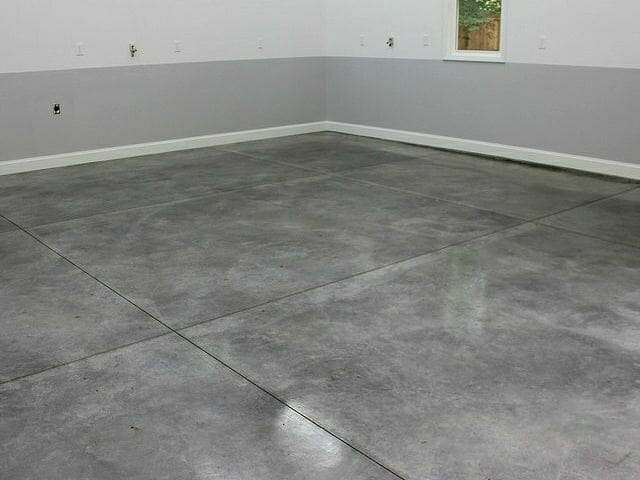 RockSolid allows up to 7 days to recoat. 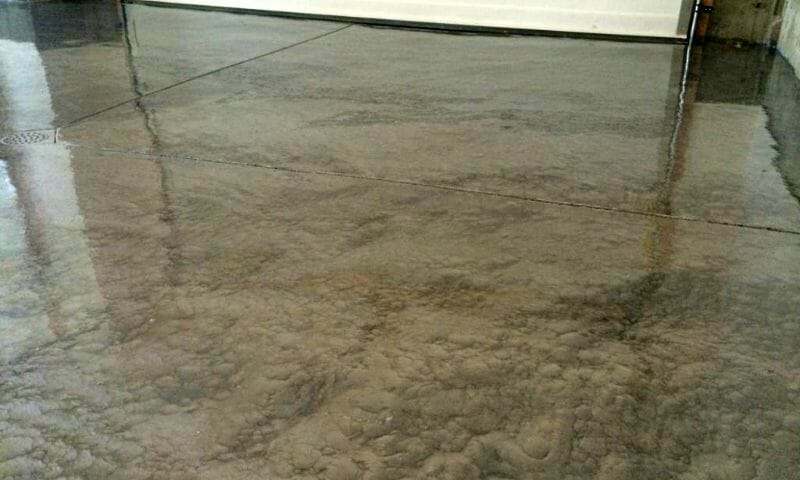 If you wait longer than that you need to rough up the surface first before recoating. 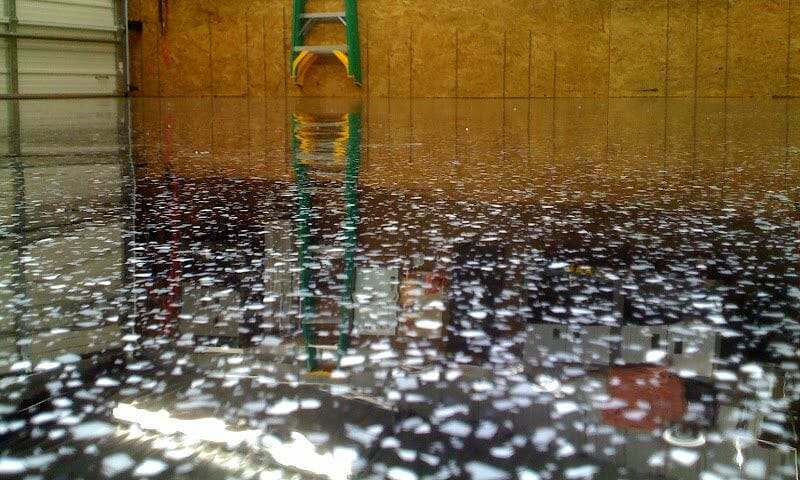 Can you use epoxy coatings on a wooden floor stairwell? 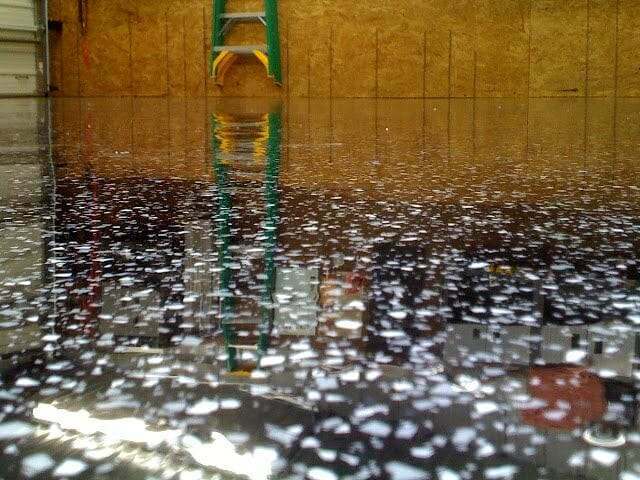 Epoxy can be applied to wood Cecilia, but it’s not the best application for stairs. 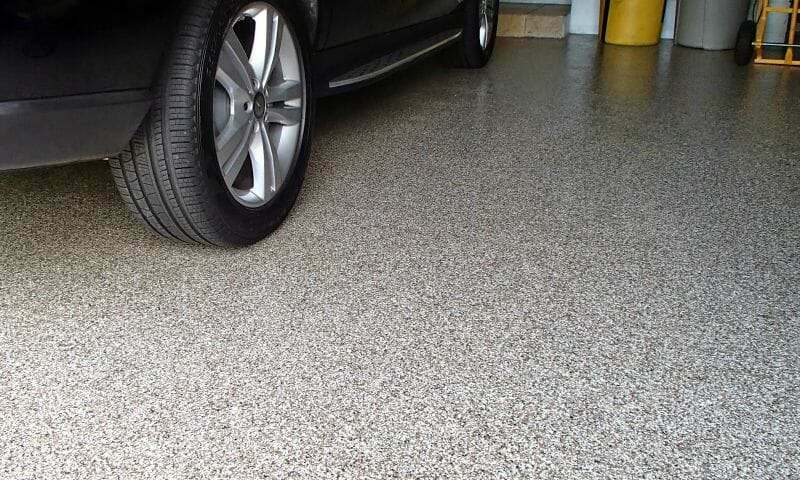 It can be slippery when wet unless you use ample anti-slip additive. 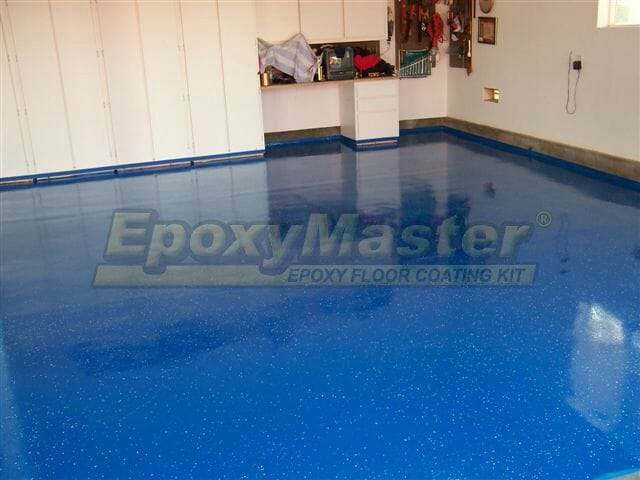 I have read all your articles on various epoxy choices. 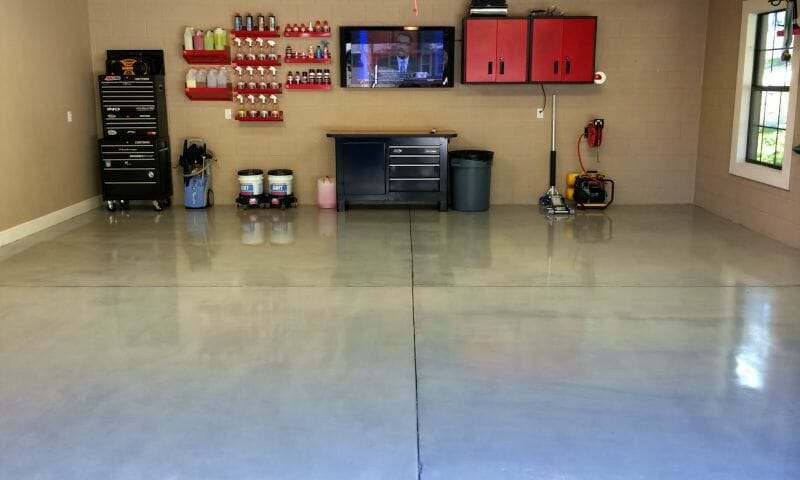 I have a garage floor which has some oil paches which could be removed completely. 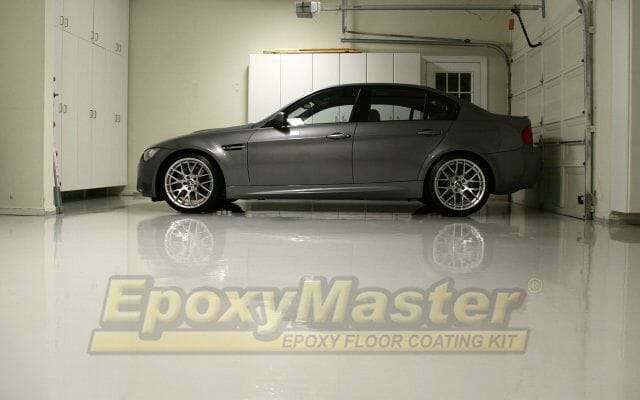 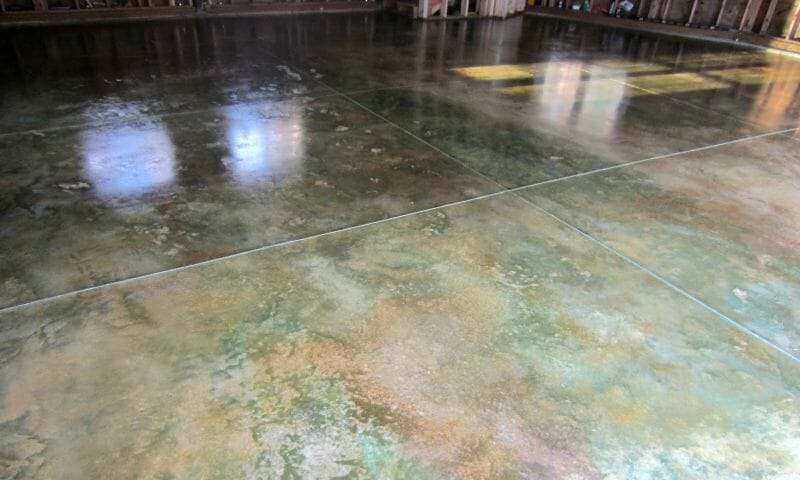 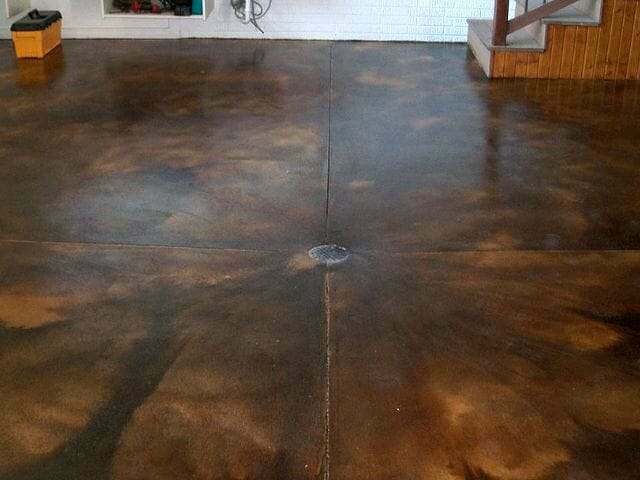 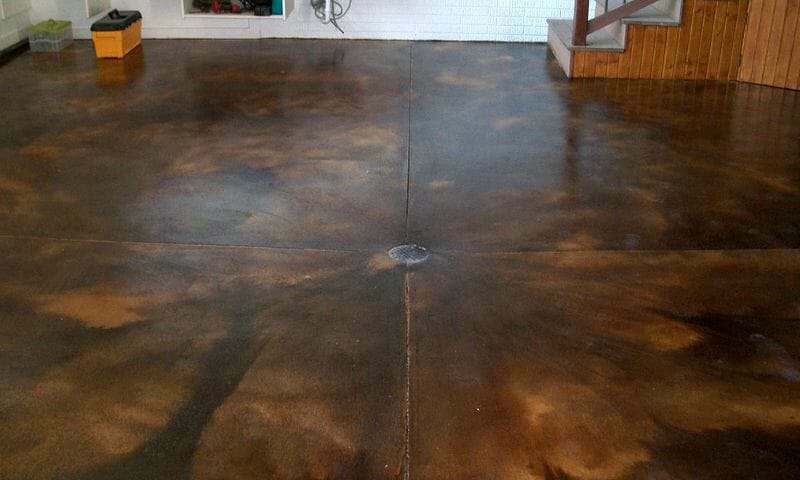 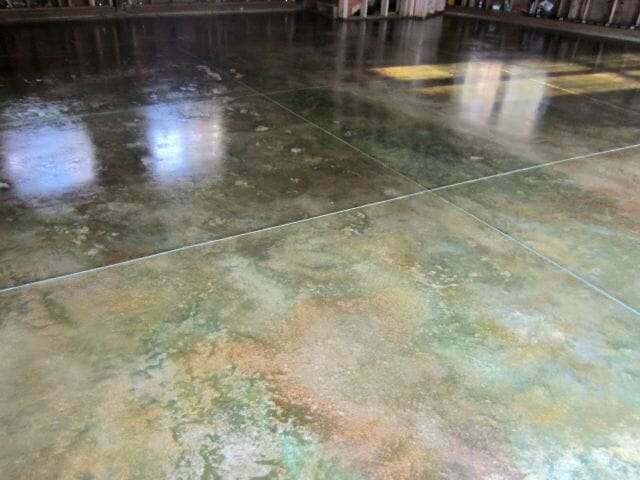 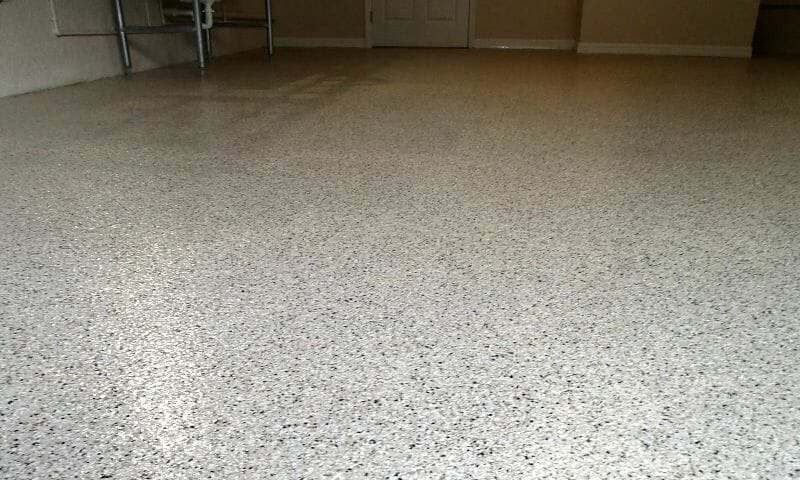 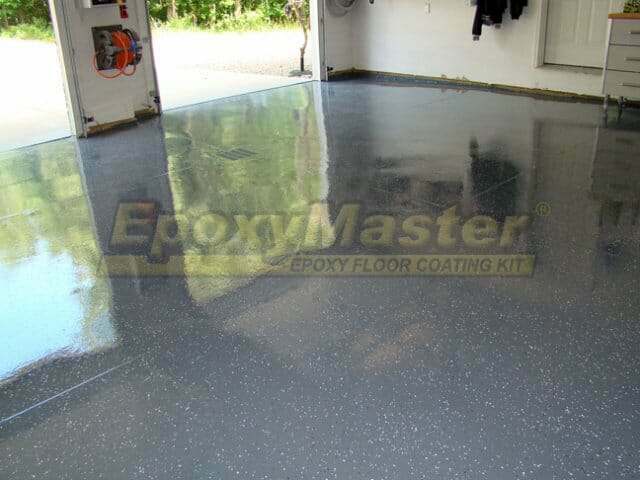 You suggested to go with thepremium multi-coat epoxy. 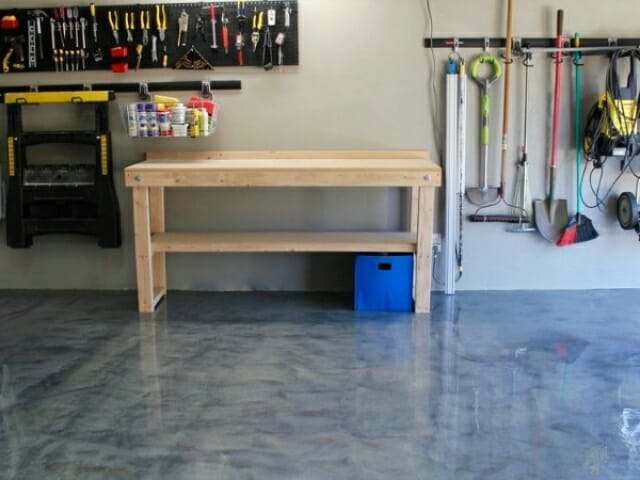 Can you suggest premium multi-coat epoxy for DIY. 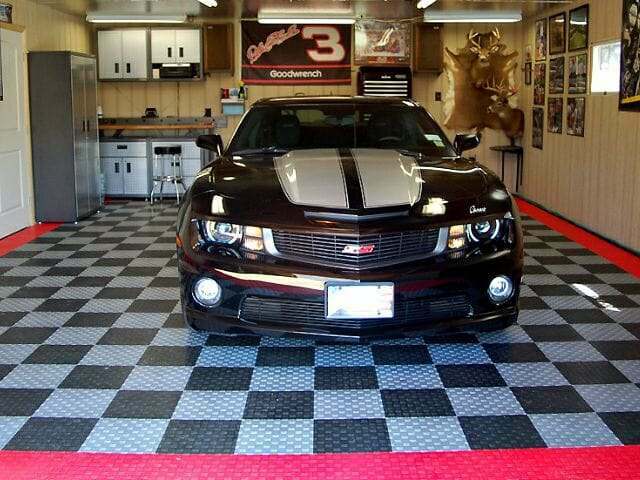 I can go with. 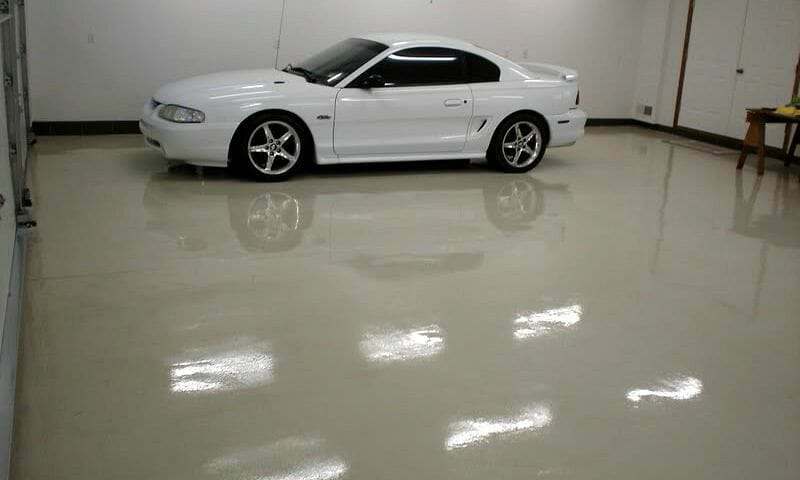 Will also apply the clear coat as you suggested. 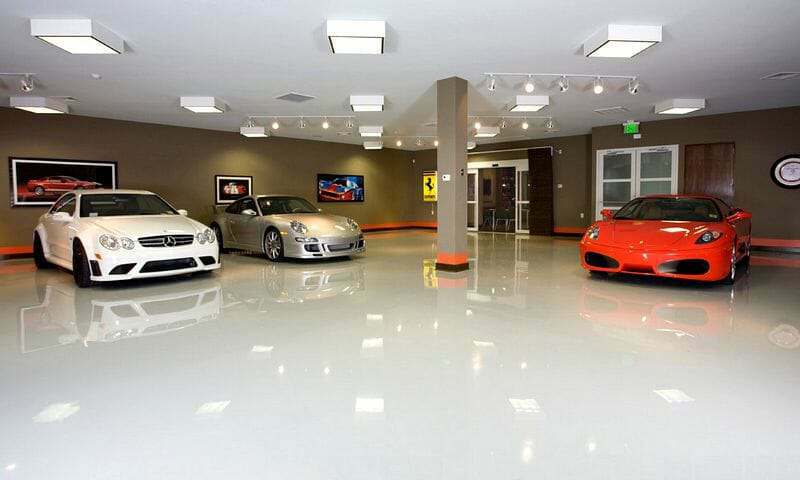 Hello Mufazal. 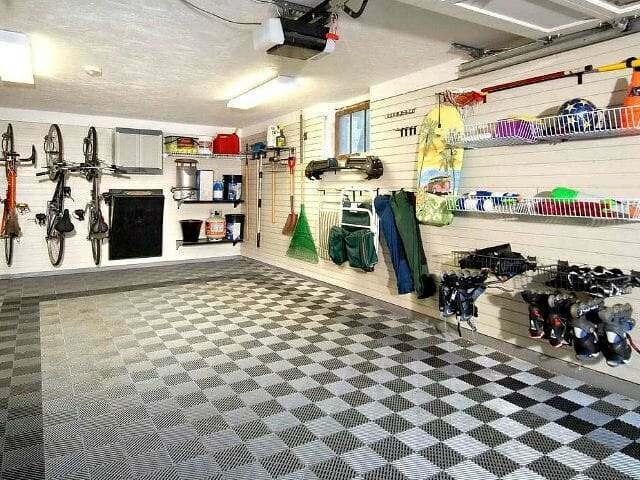 There are many good quality products to choose from. 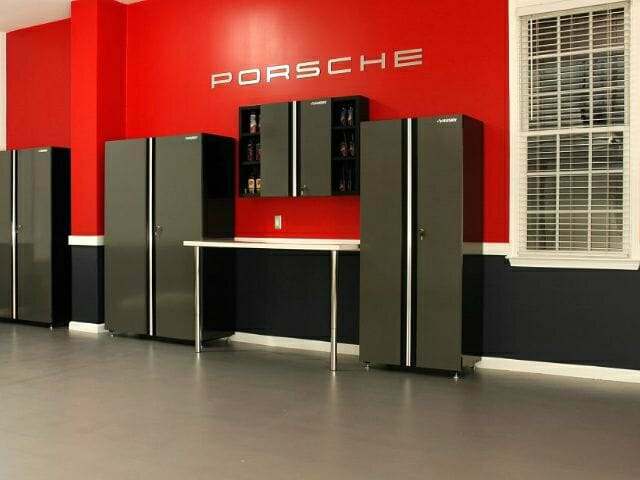 We suggest pricing out what some of our sponsors have available. 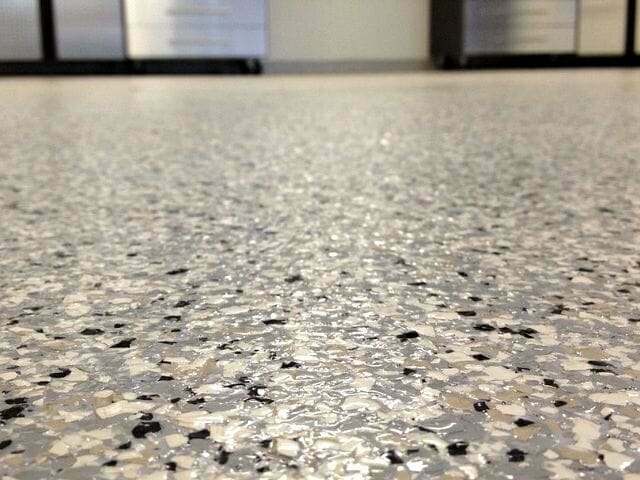 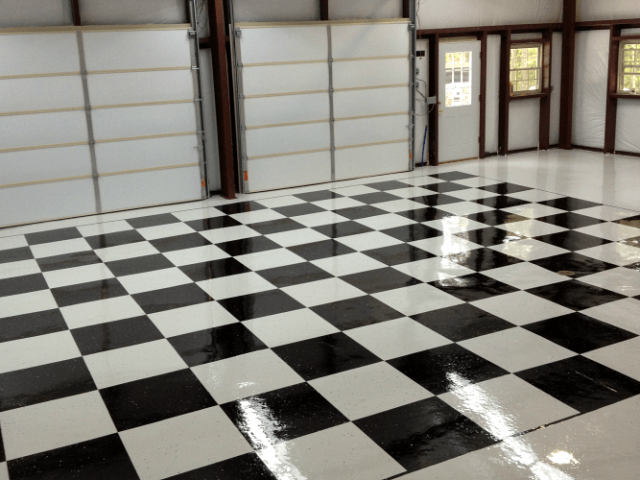 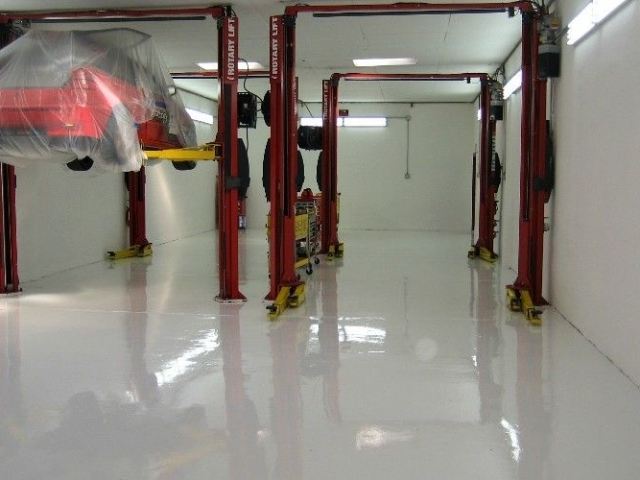 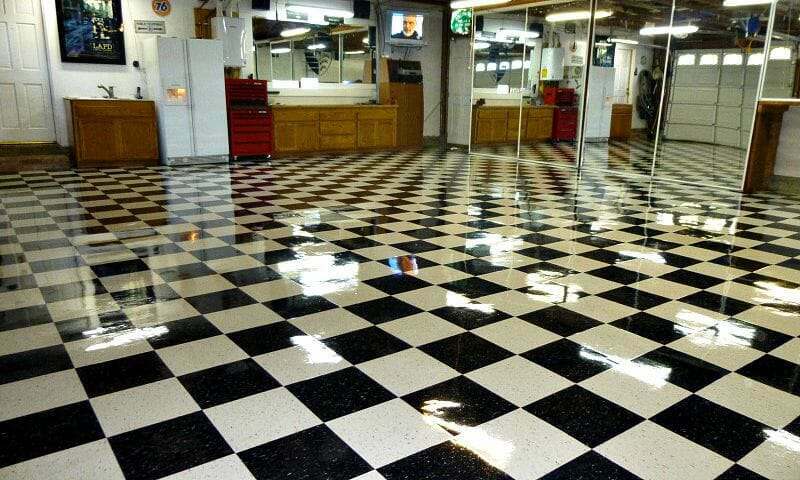 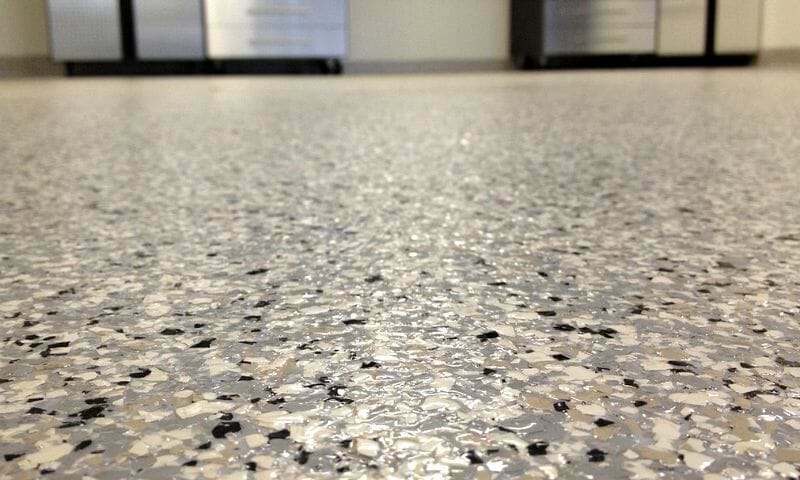 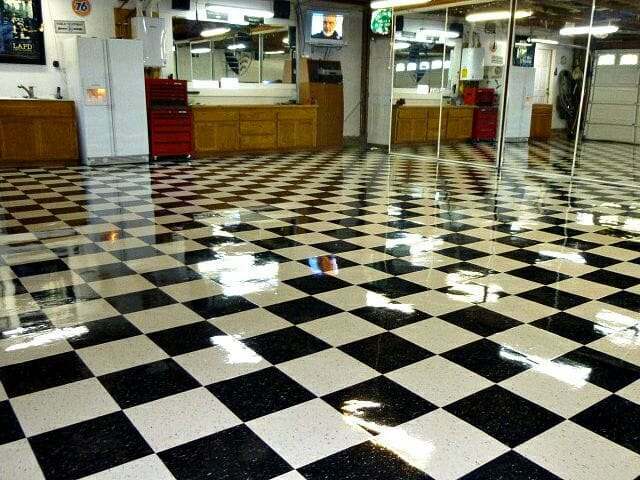 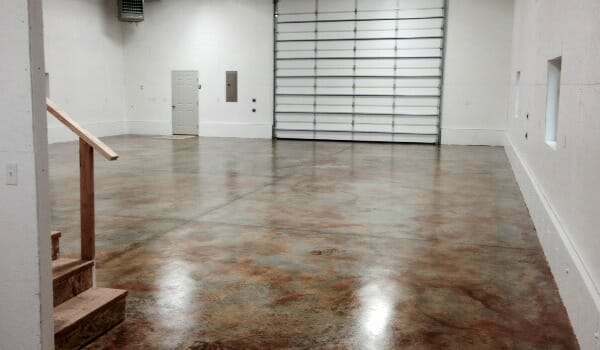 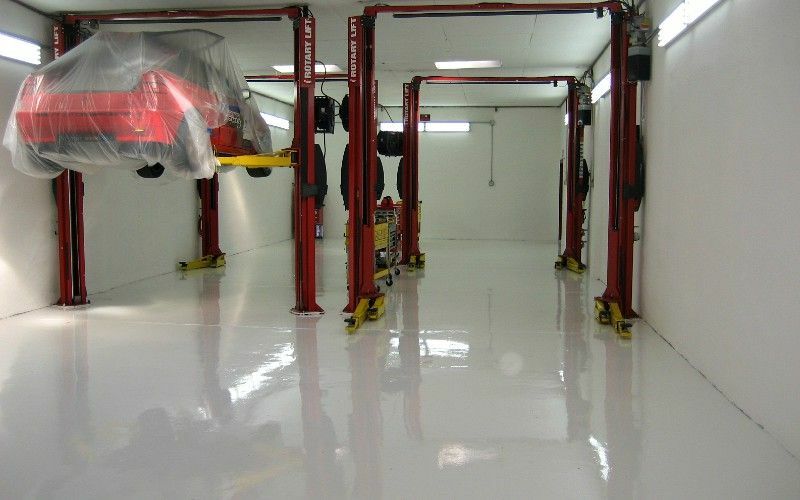 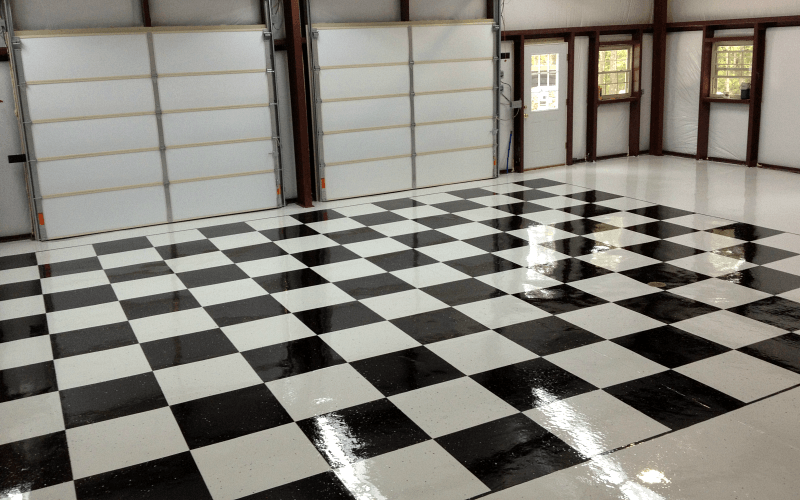 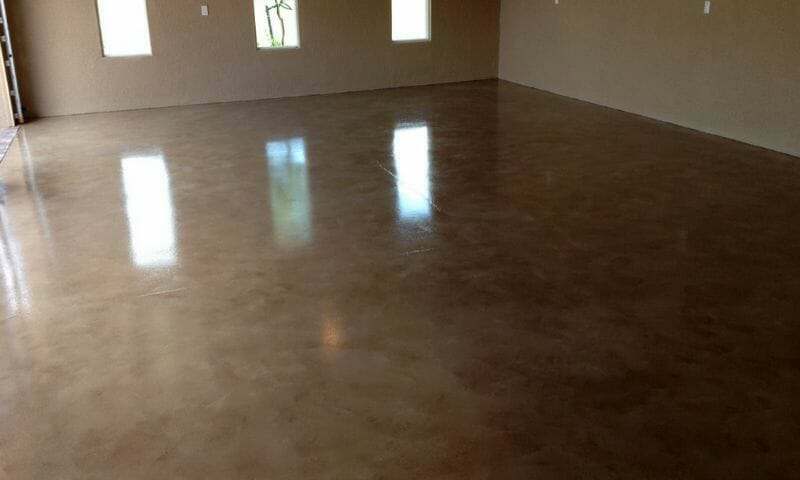 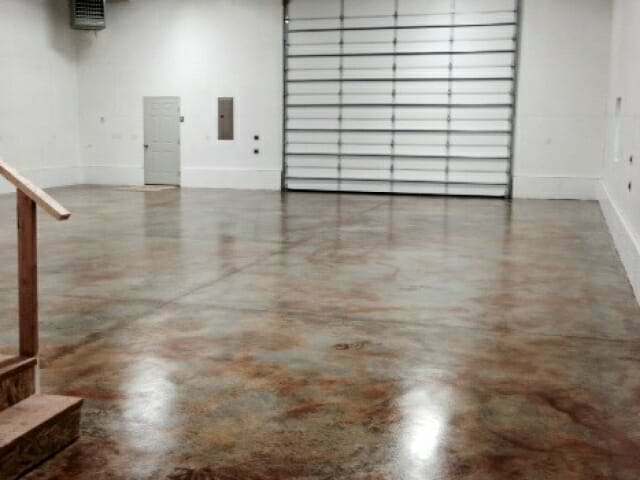 EpoxyMaster, Legacy Industrial, Garage Flooring LLC, and ArmorPoxy are great examples. 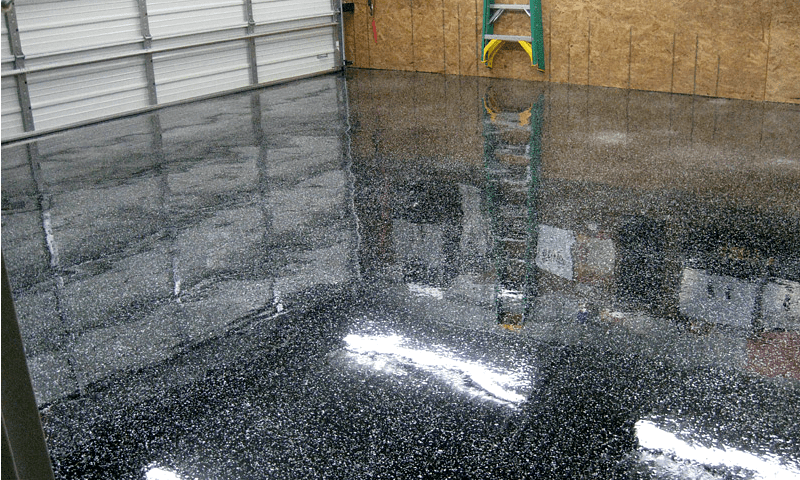 They all sell multi-coat high solids epoxy systems that we know to be excellent. 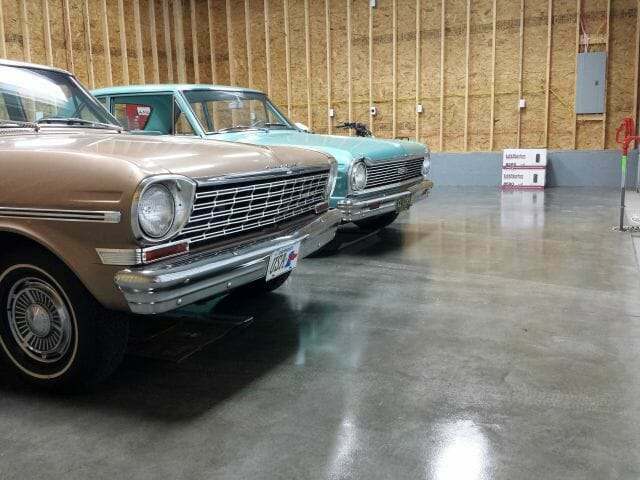 Hello Dale. 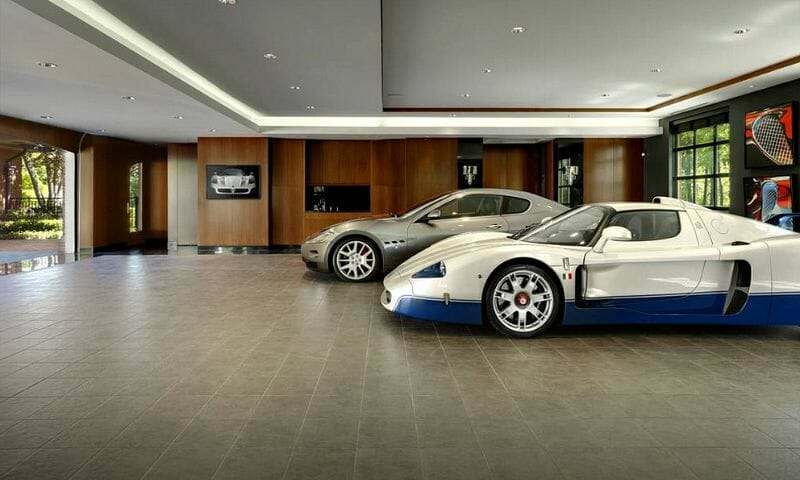 The short answer to your question is yes. 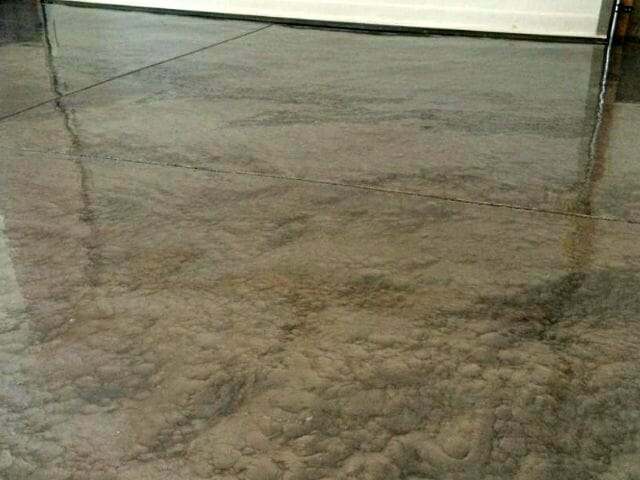 Are you sure it’s polycurimine though? 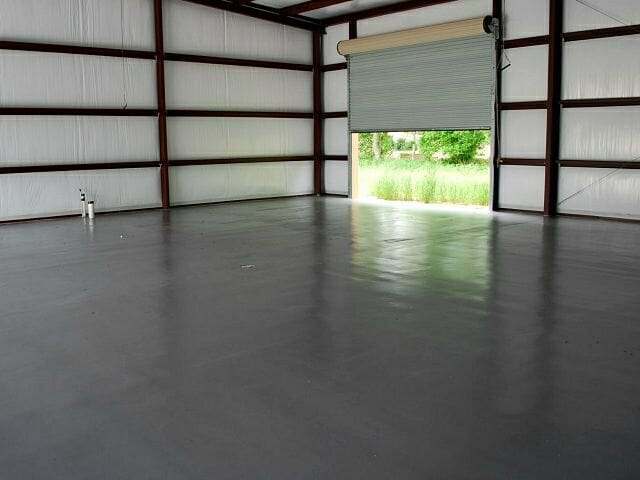 The reason I ask is that it was first developed for commercial use about five years ago. 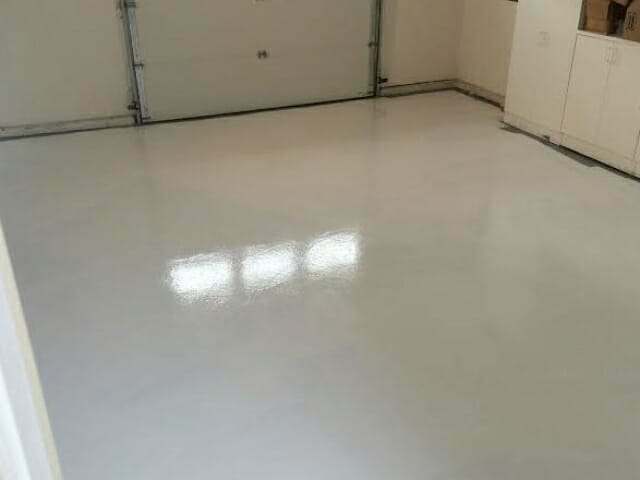 If you are sure it is polyucuramine or you know for a fact that it’s a resinous coating and not paint, then we have an article here that explains just how you can do what you are asking.